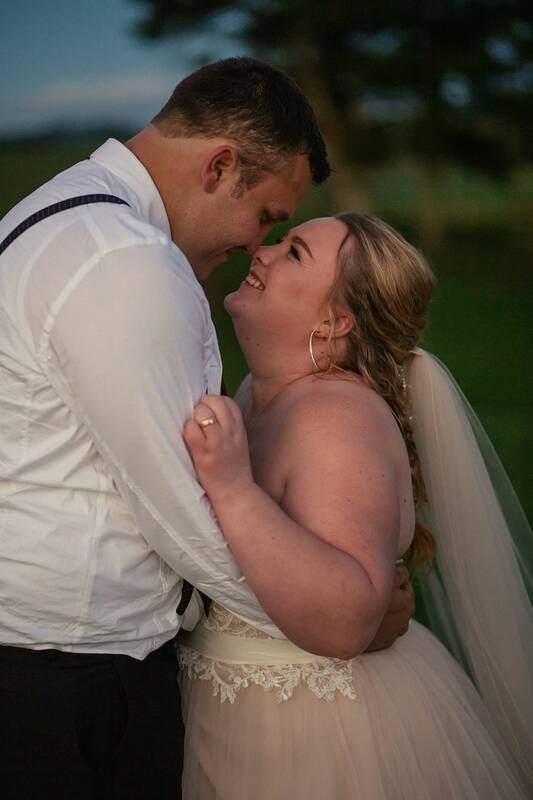 You might remember Zoe and Ryan from their engagement post (here). 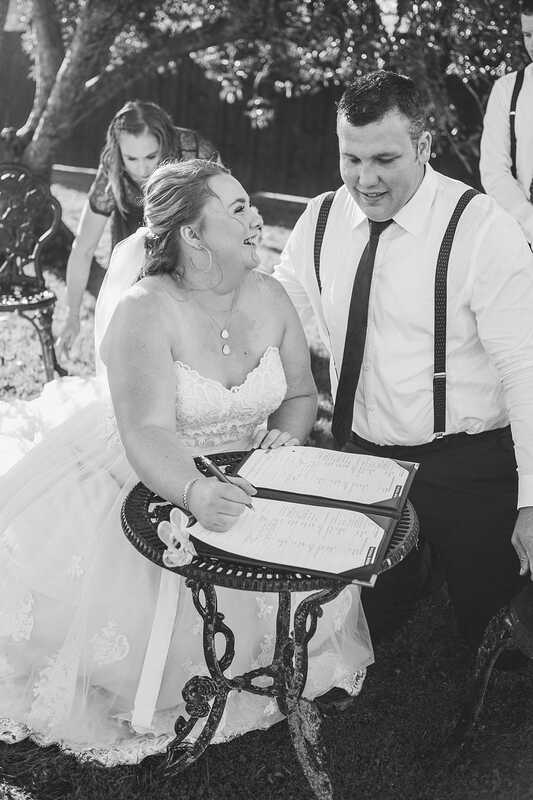 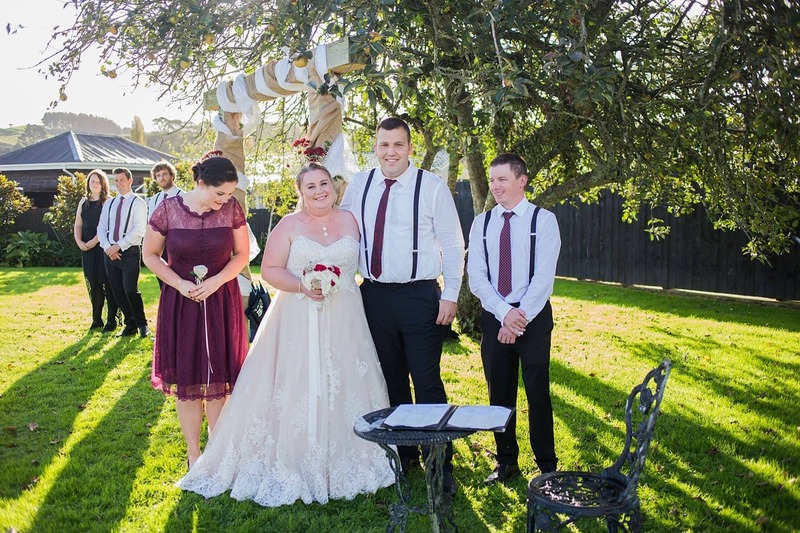 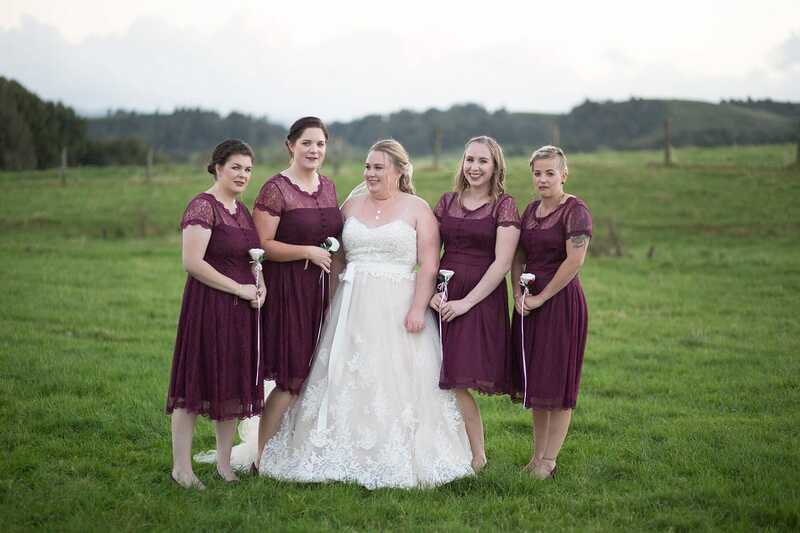 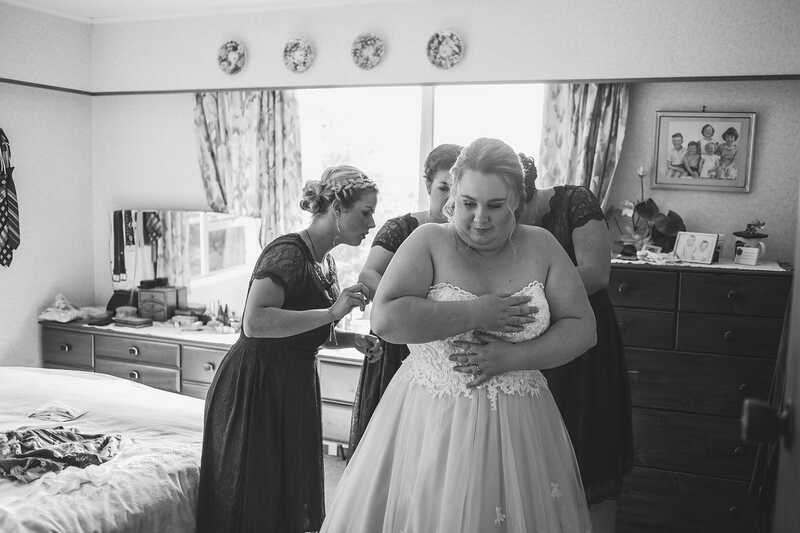 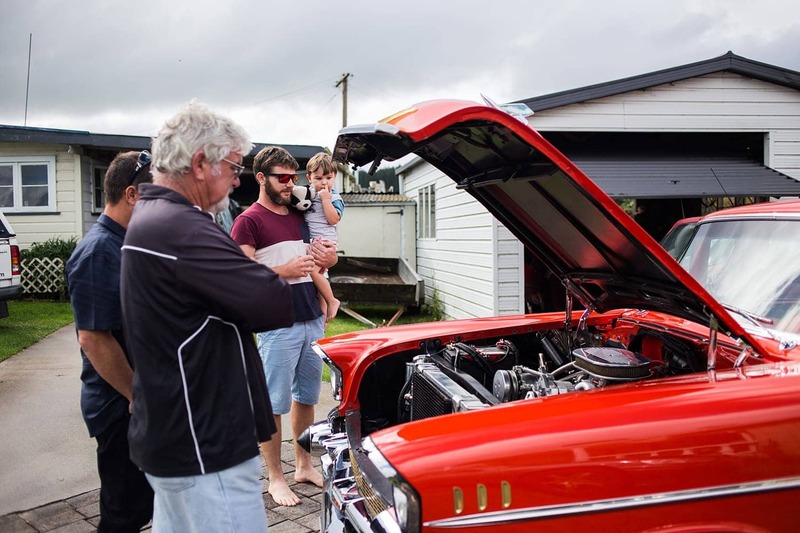 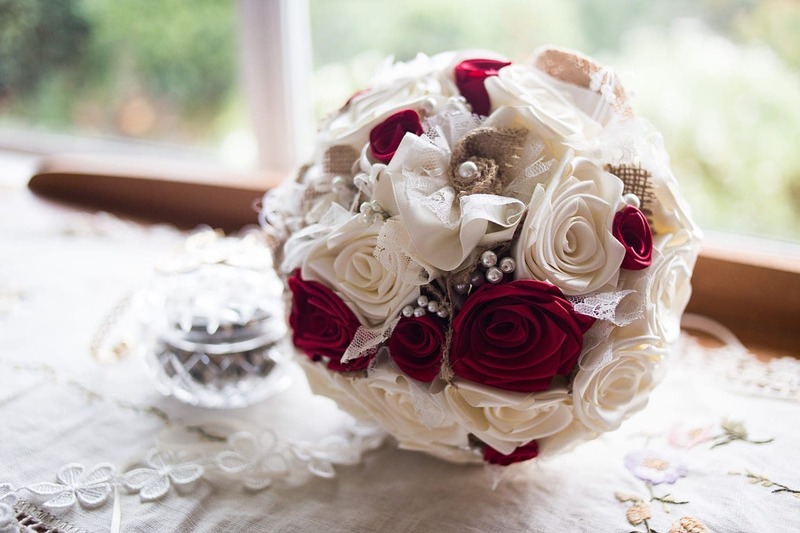 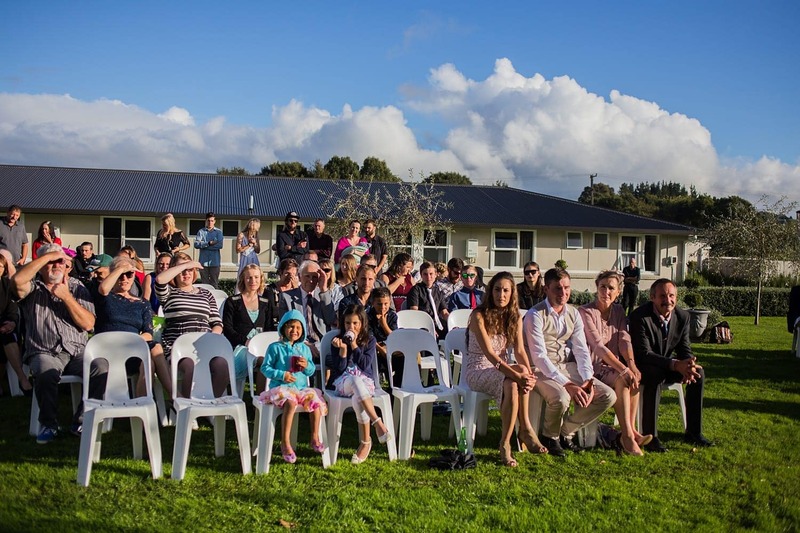 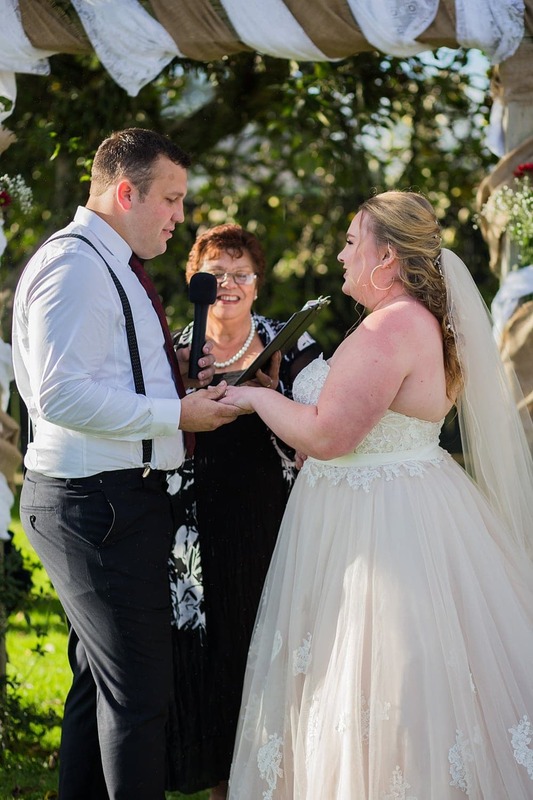 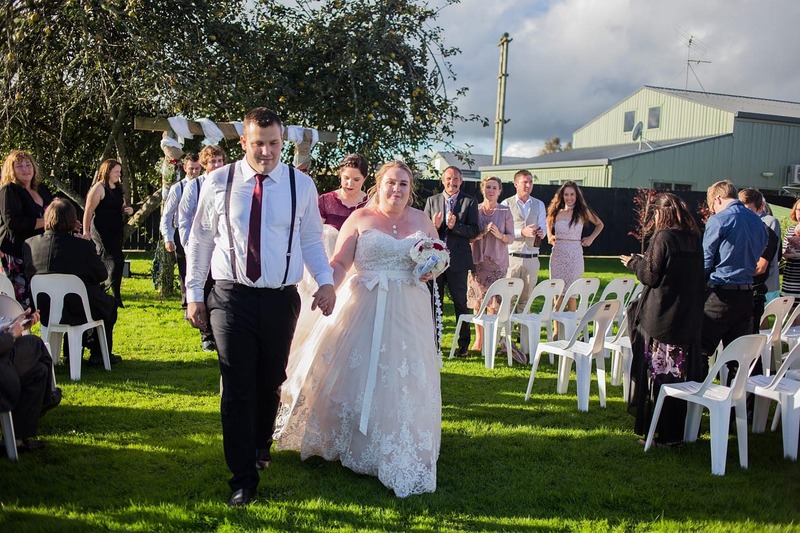 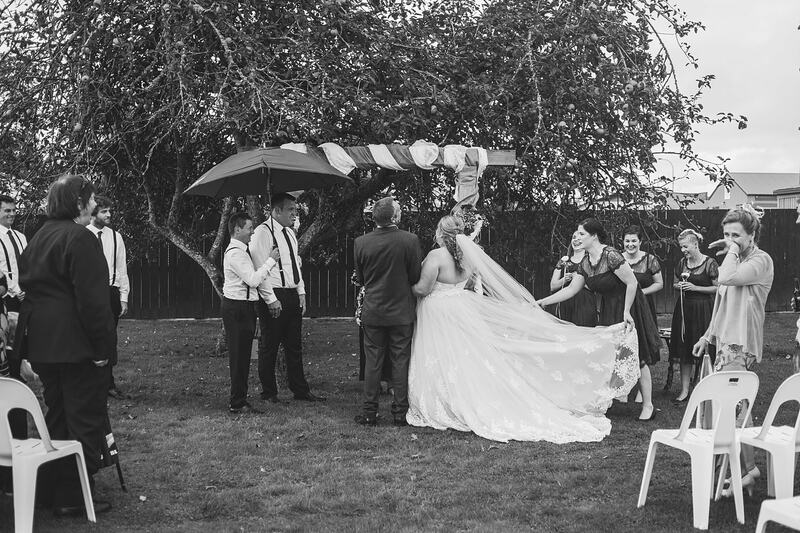 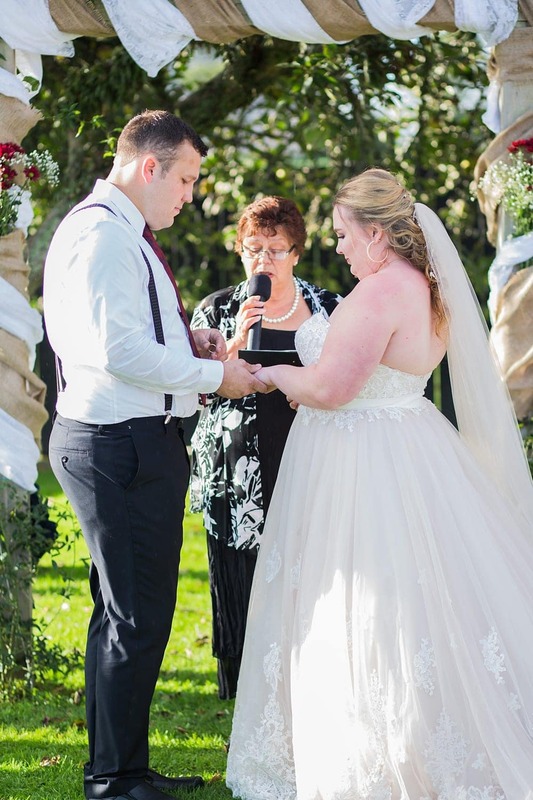 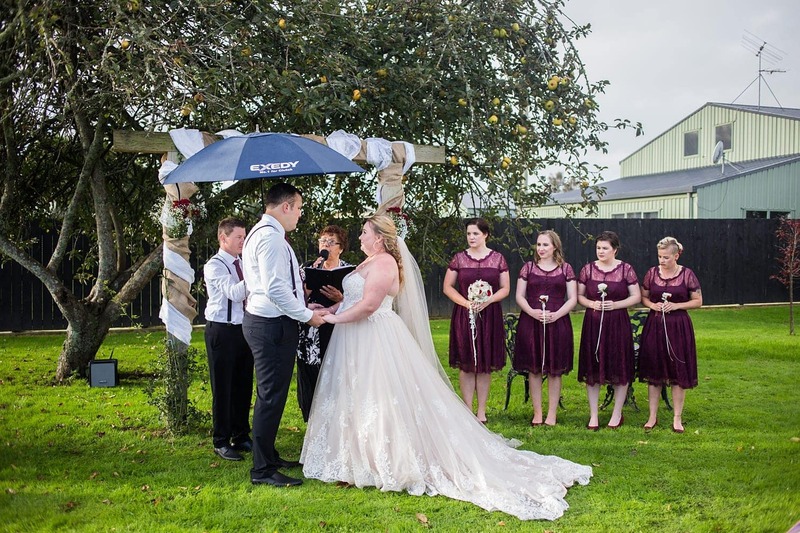 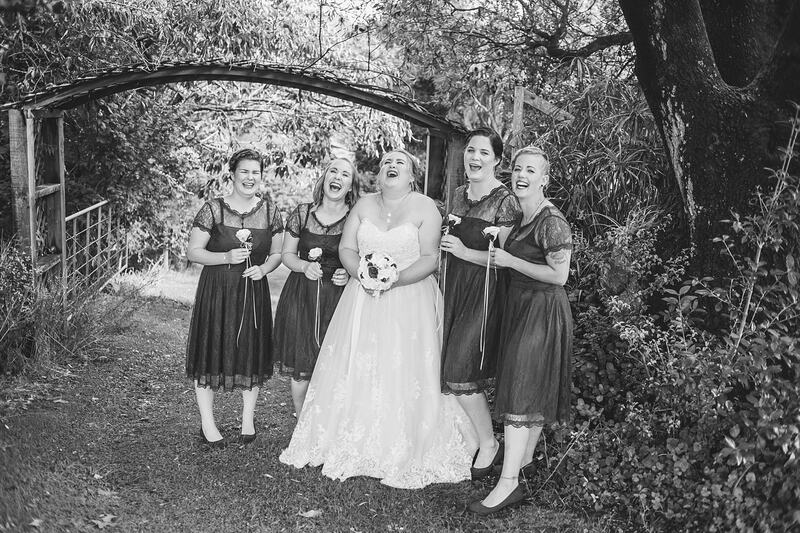 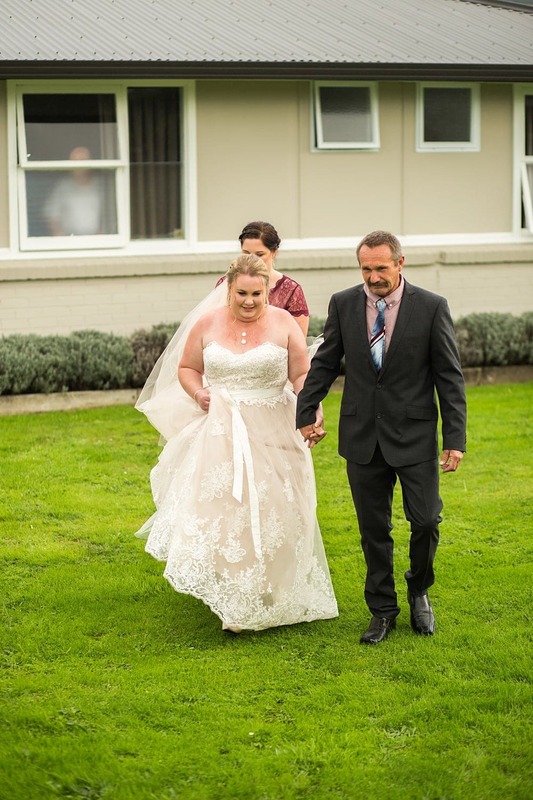 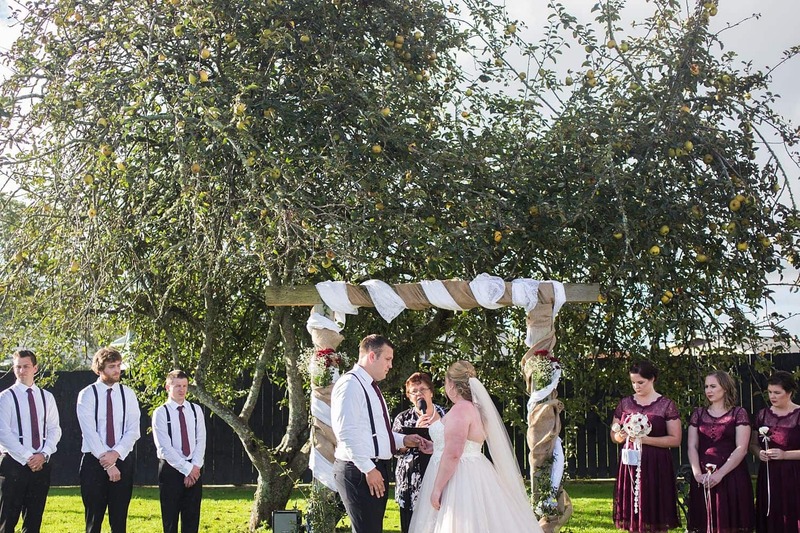 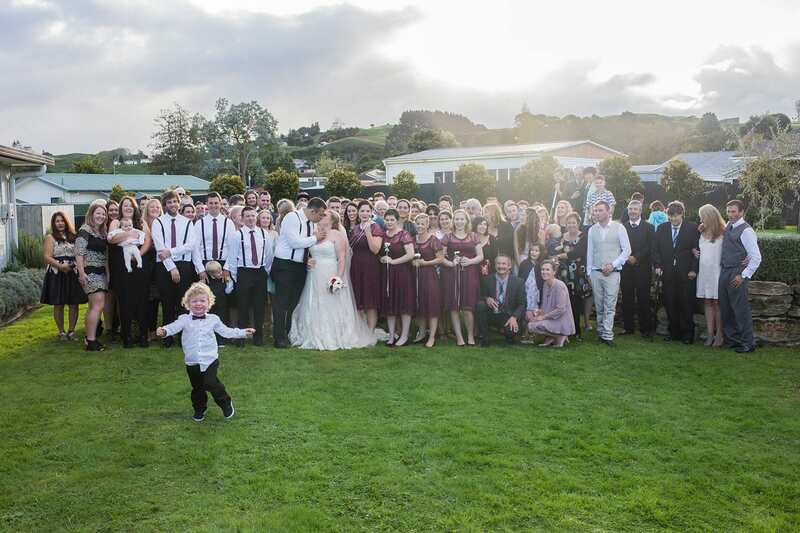 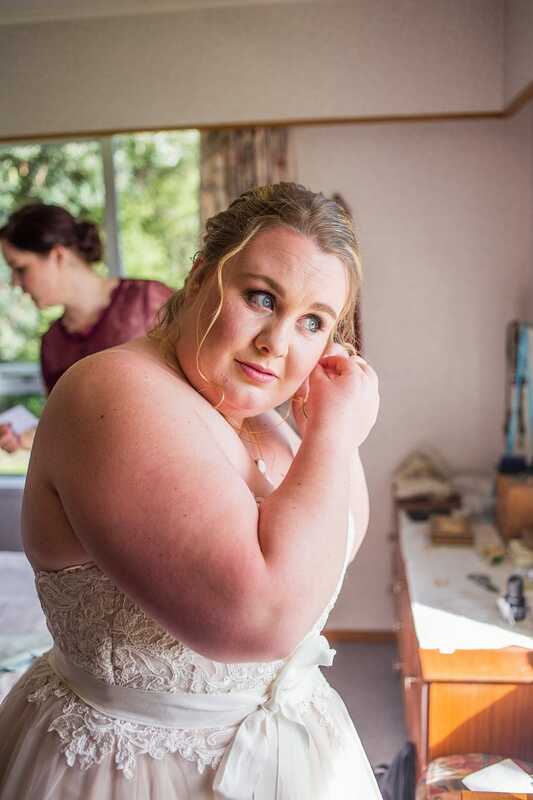 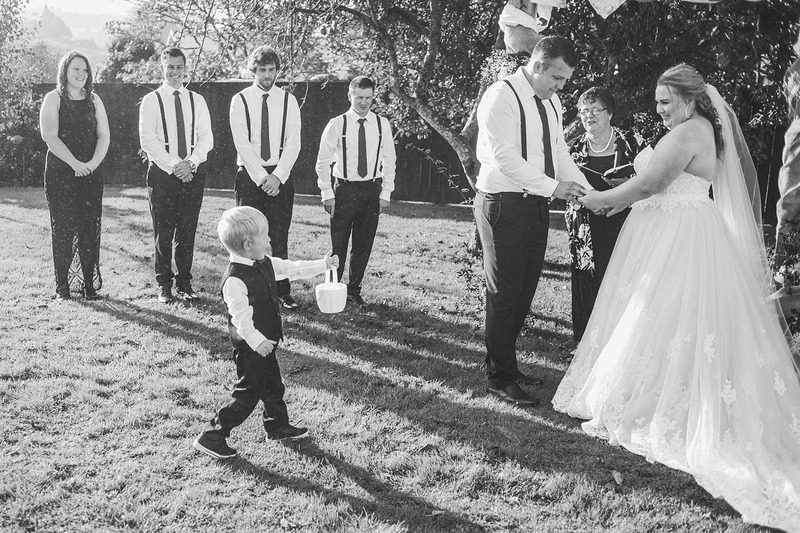 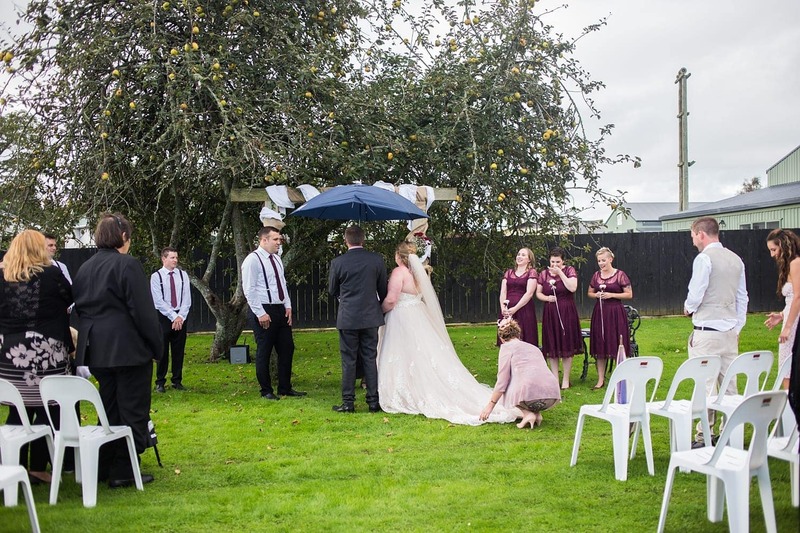 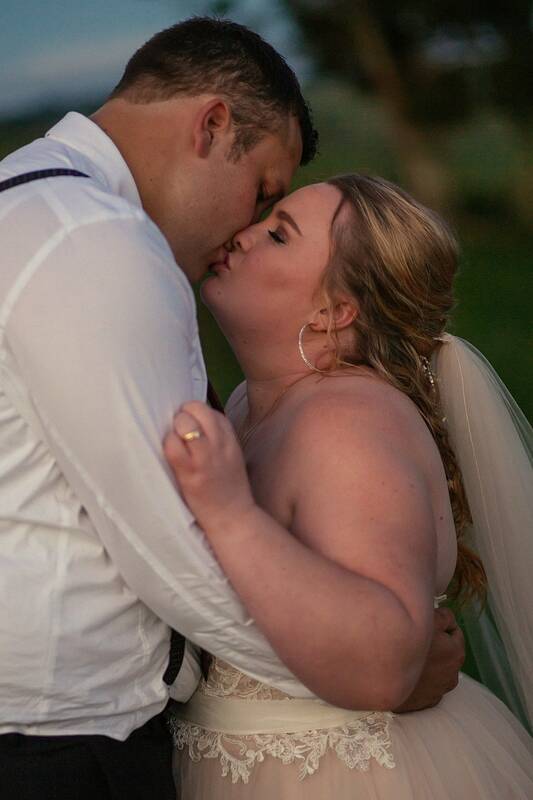 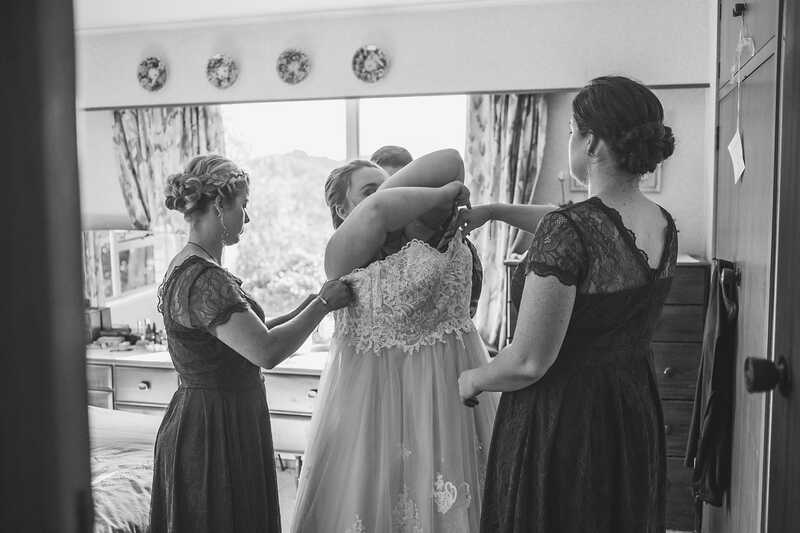 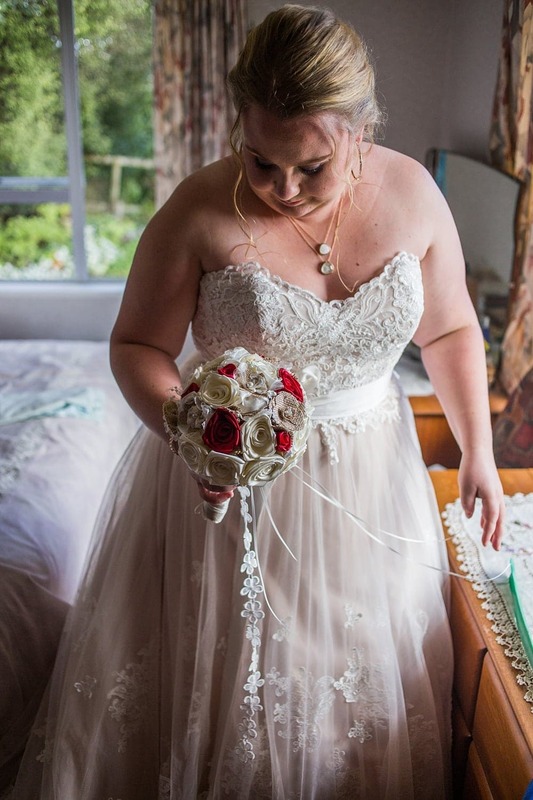 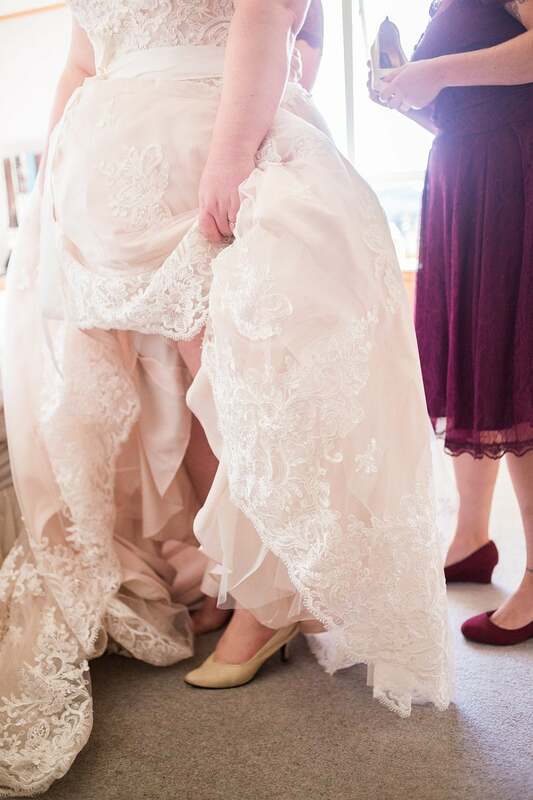 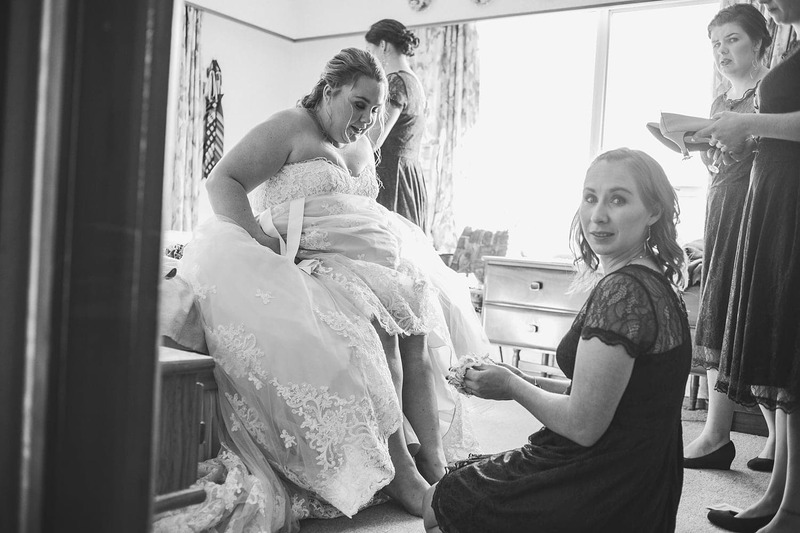 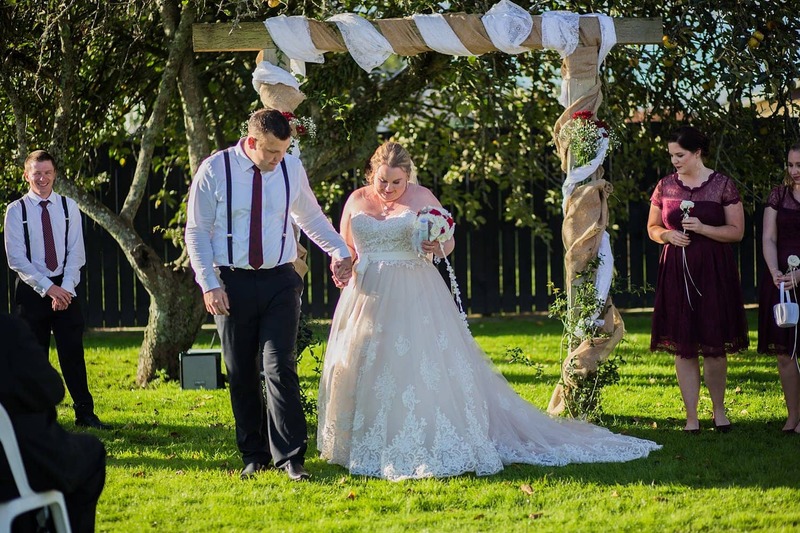 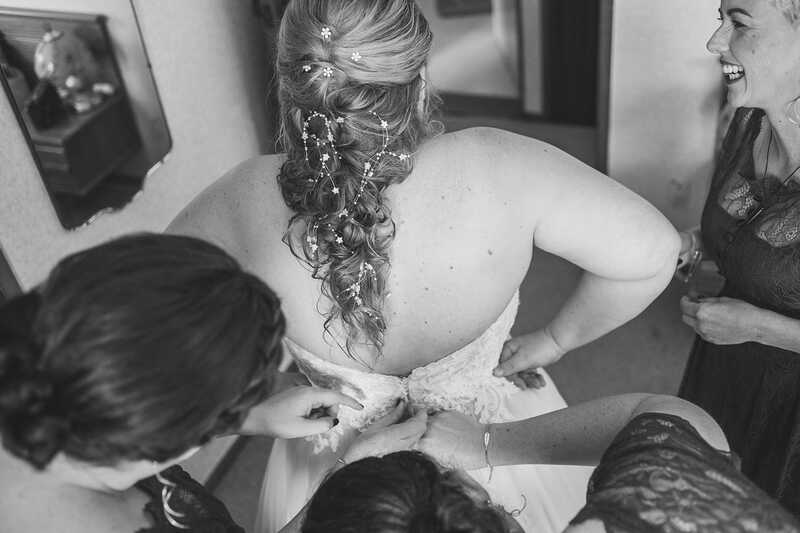 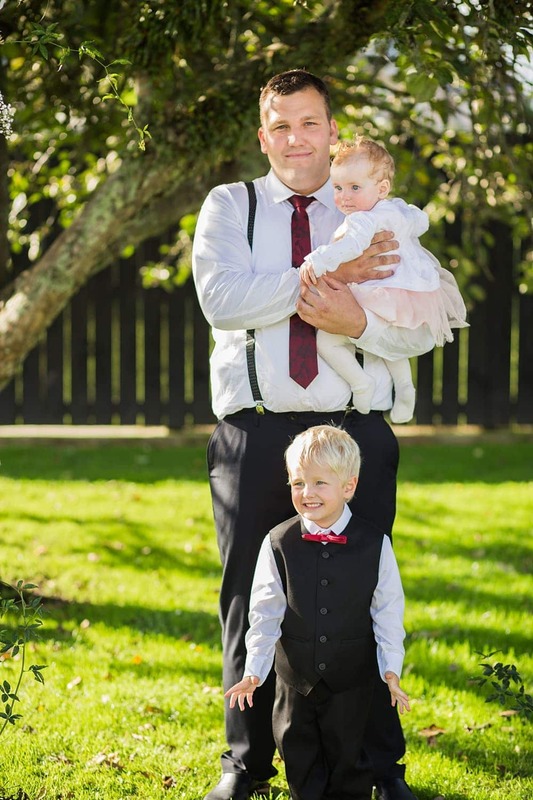 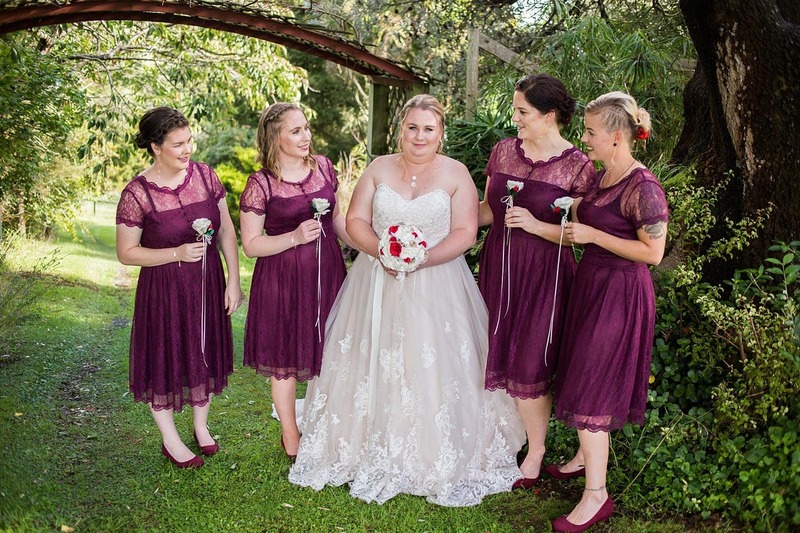 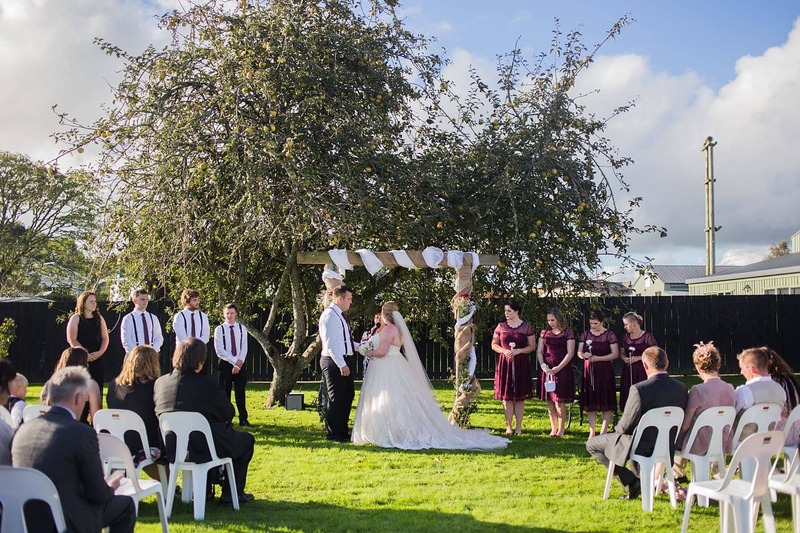 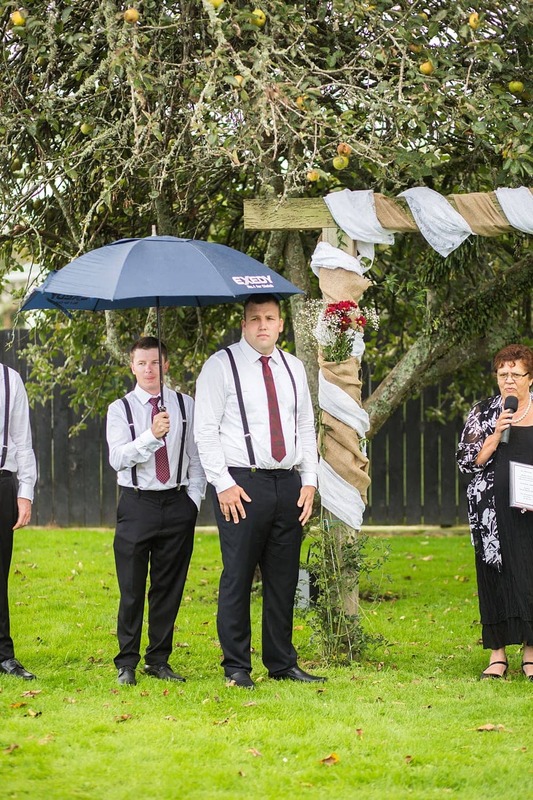 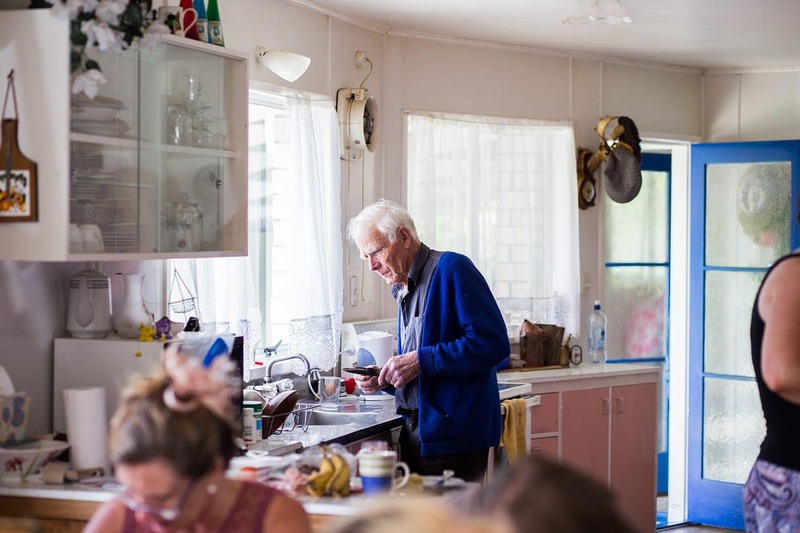 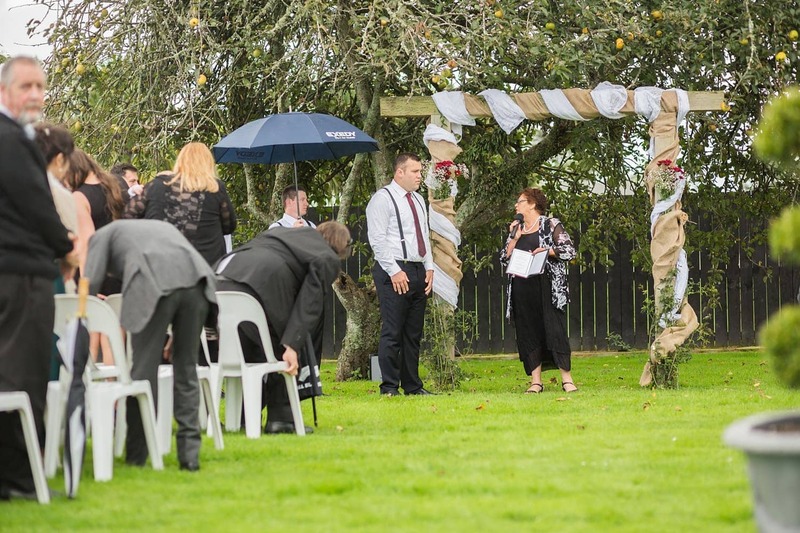 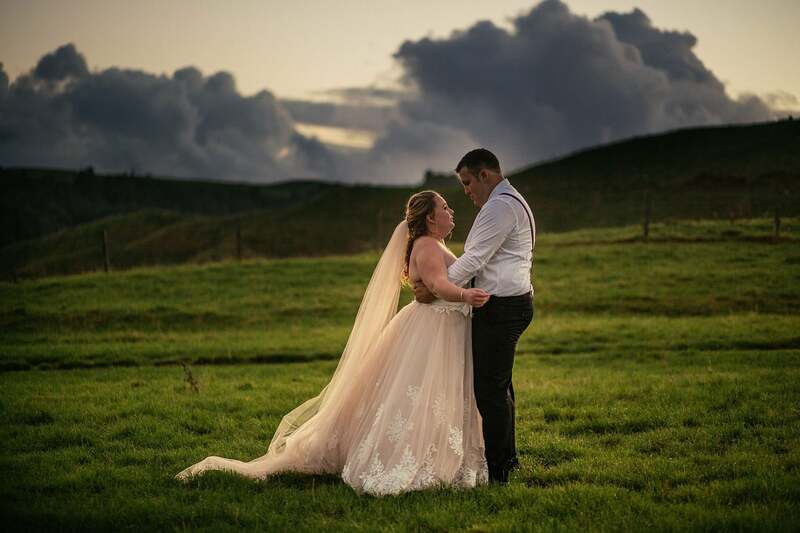 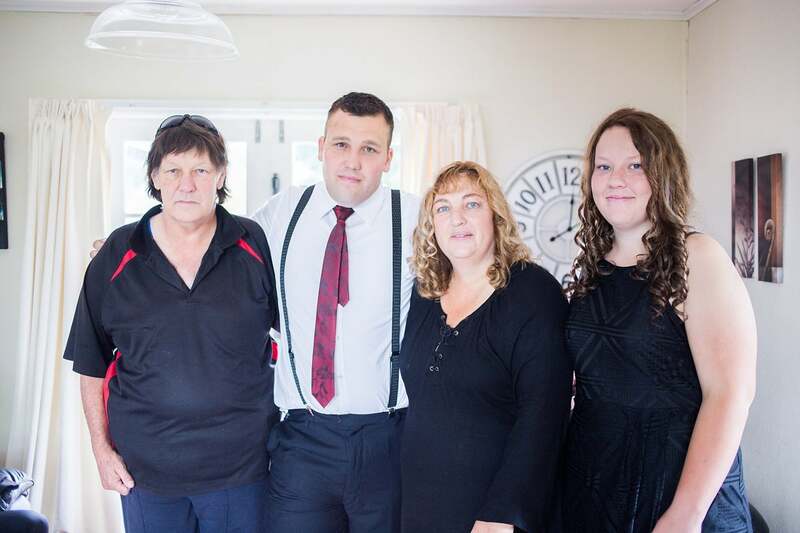 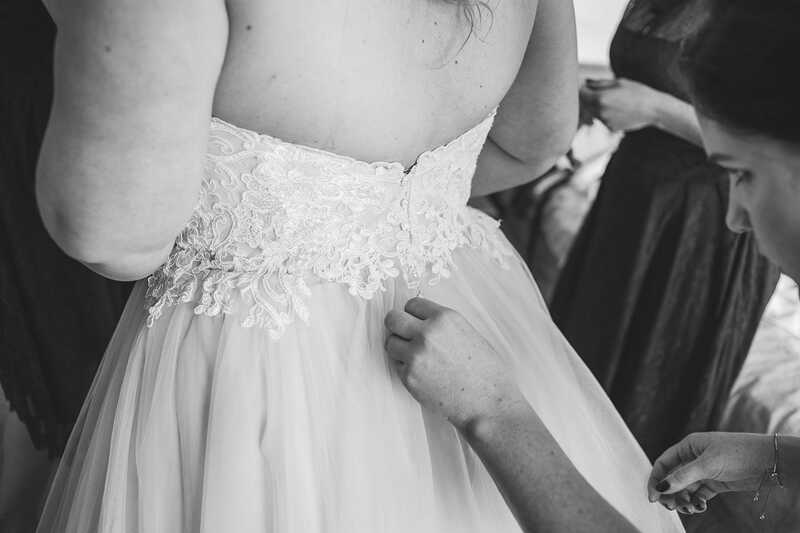 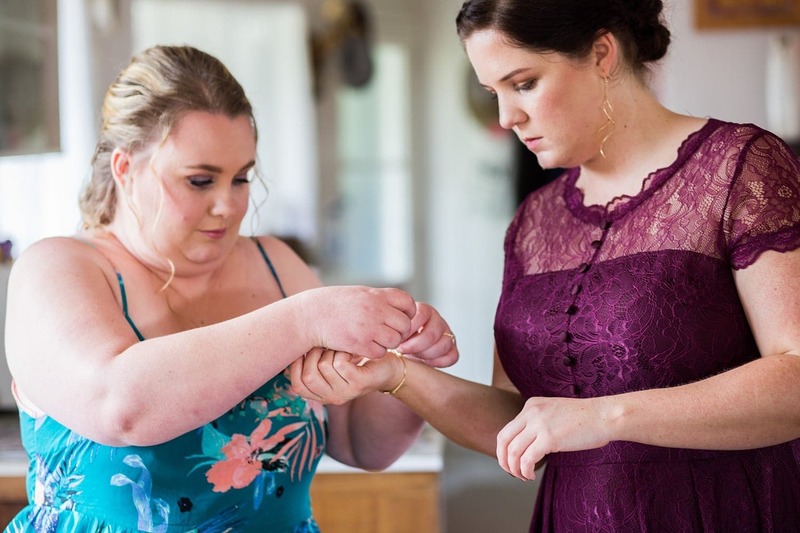 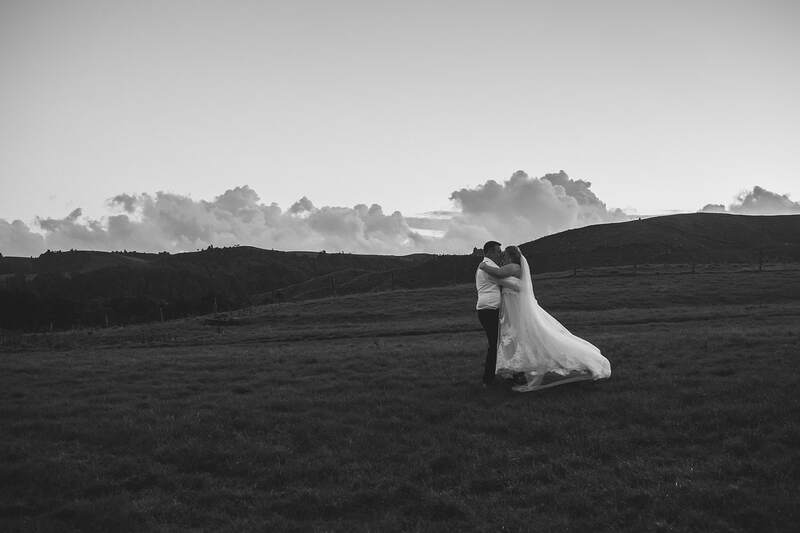 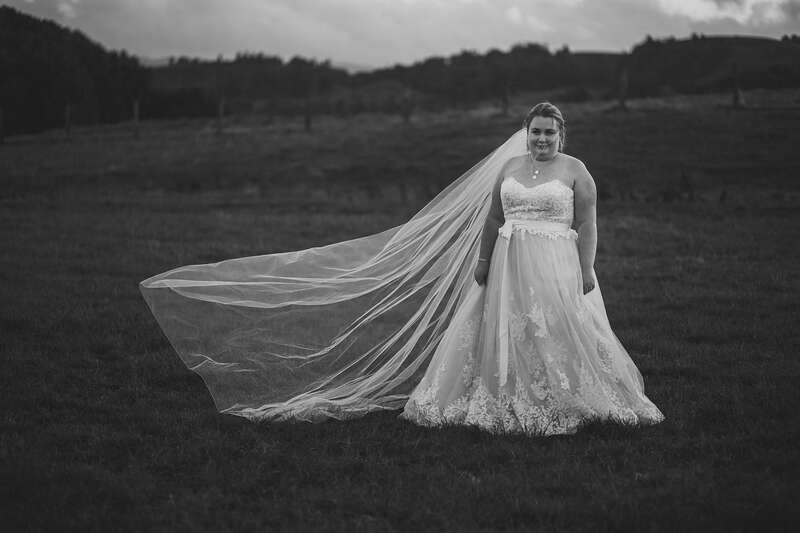 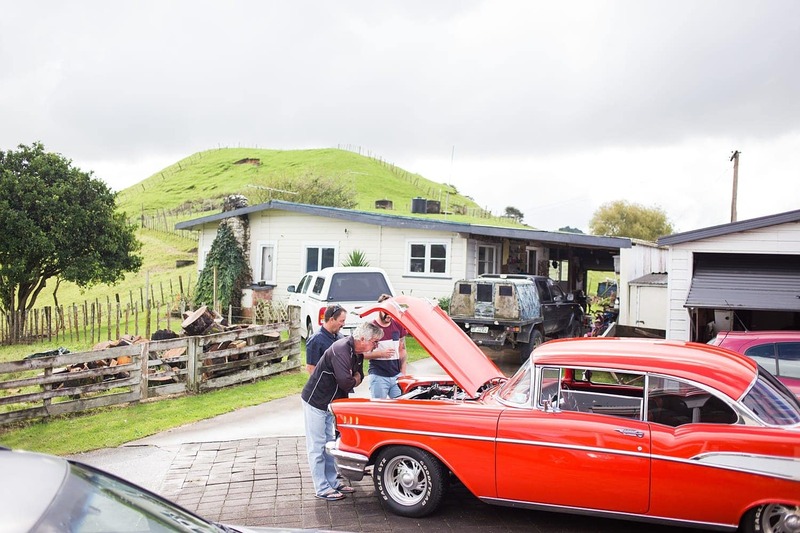 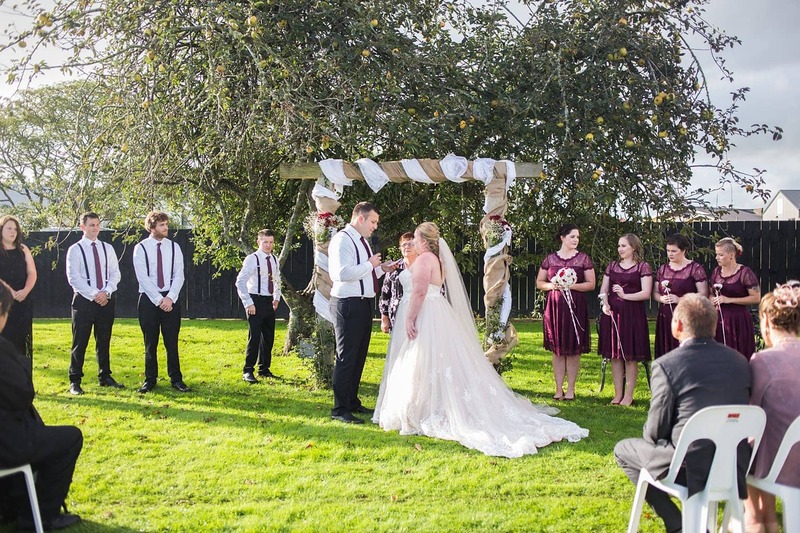 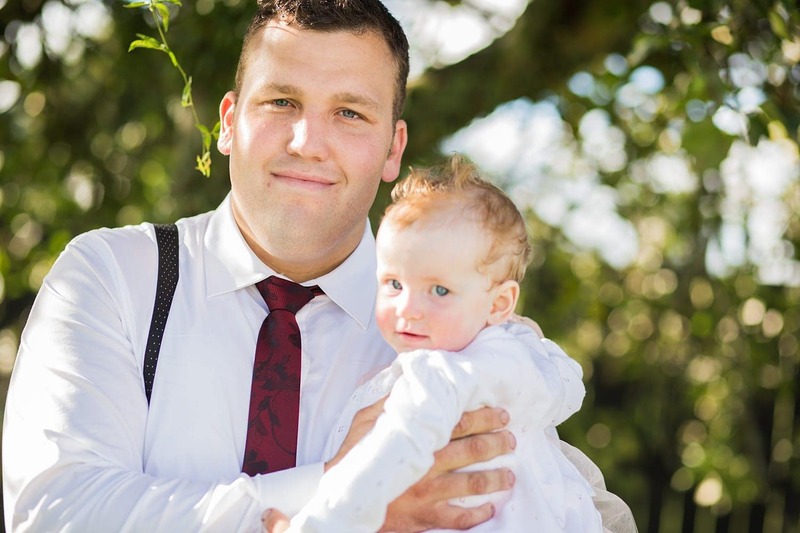 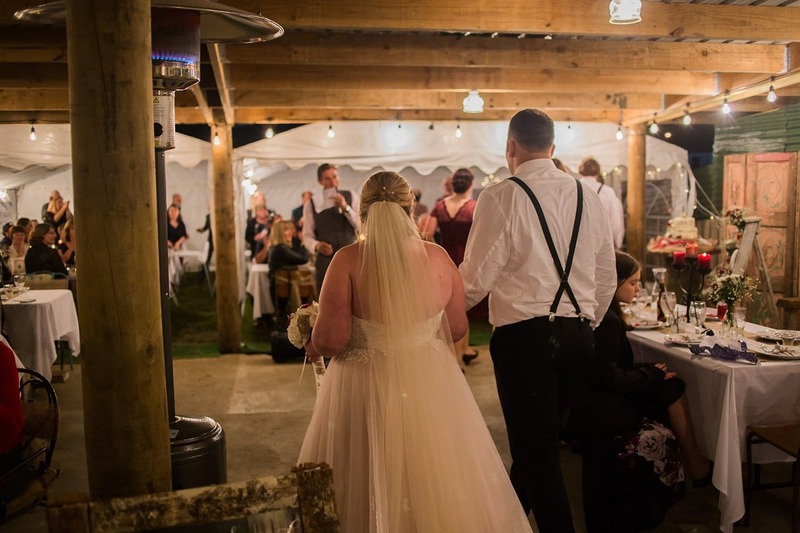 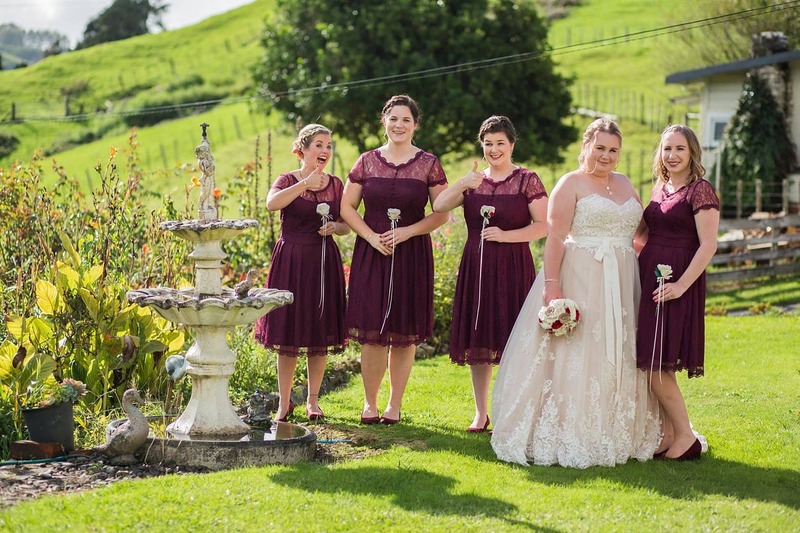 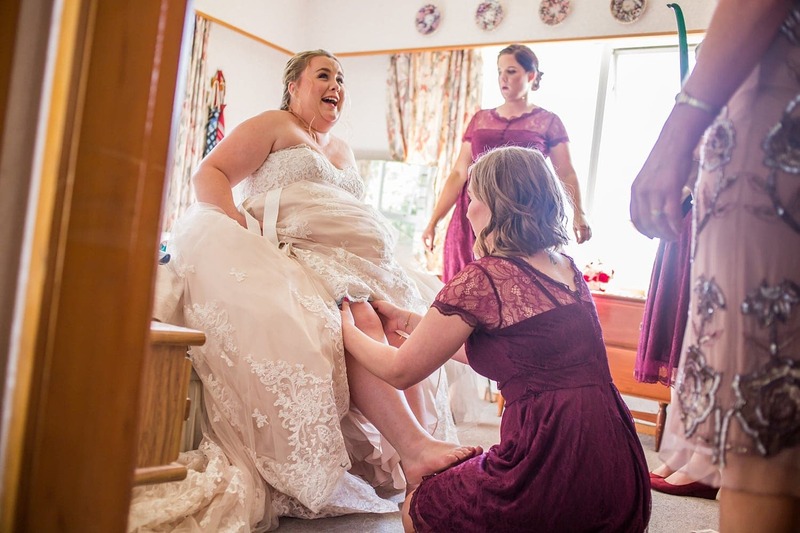 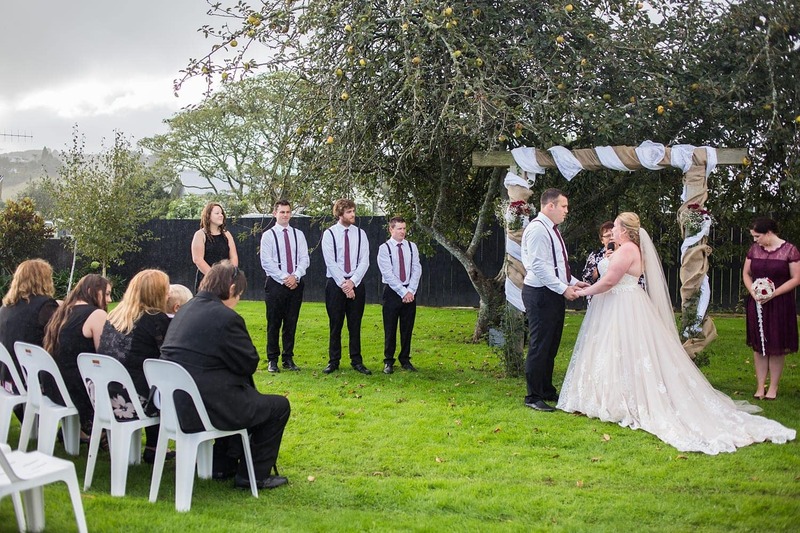 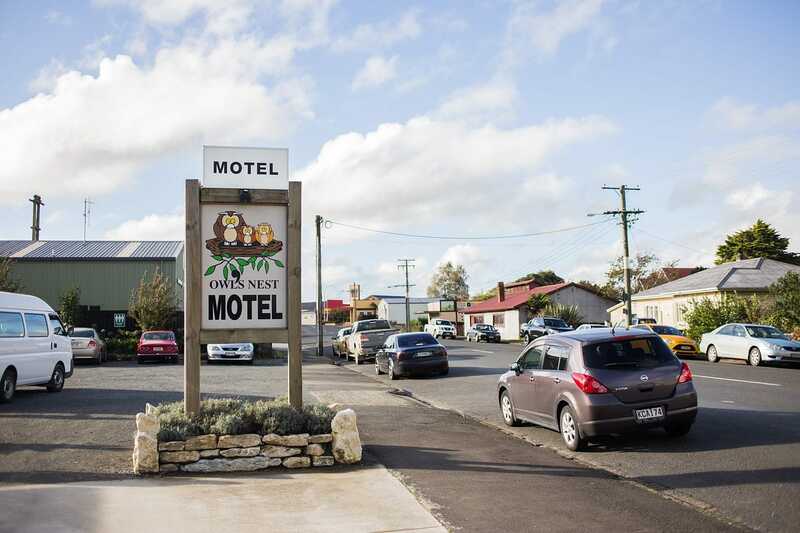 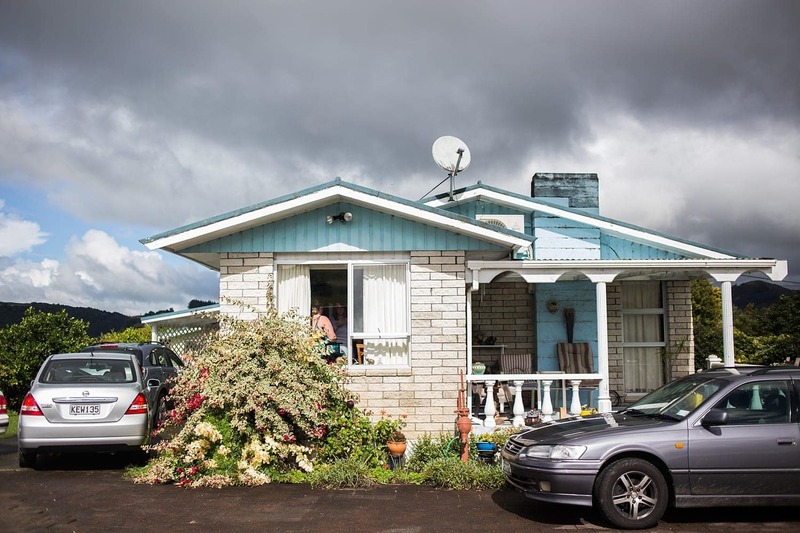 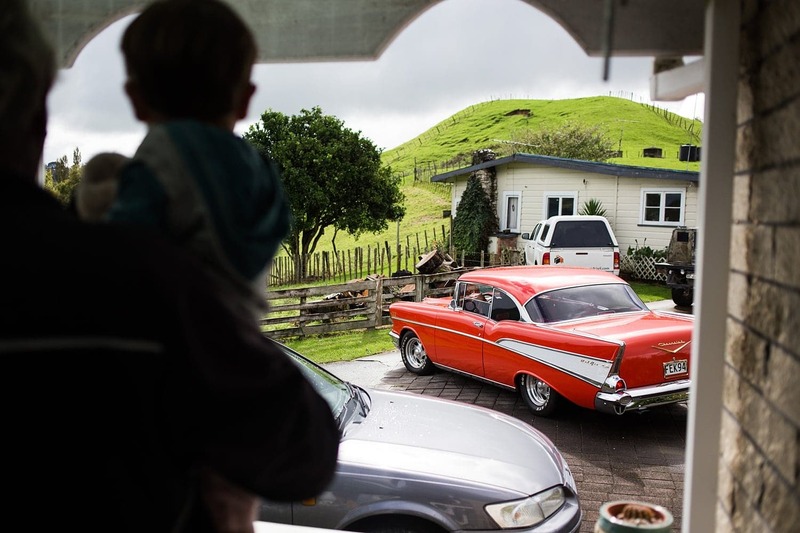 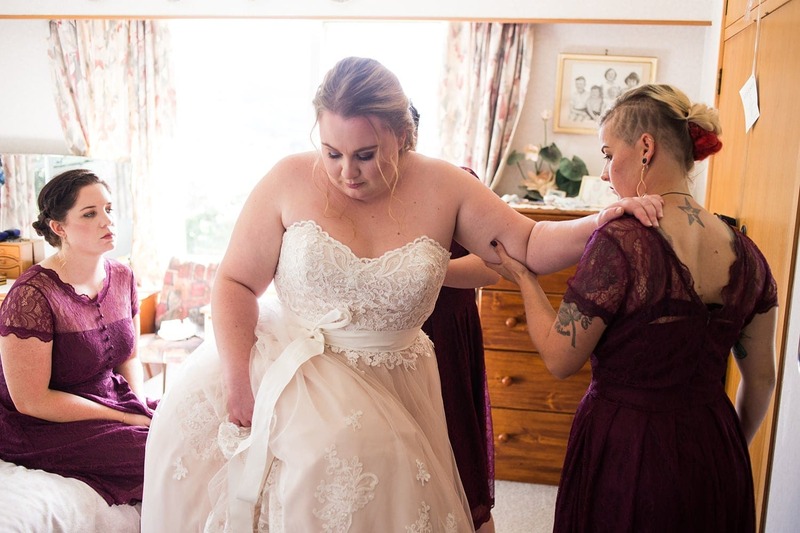 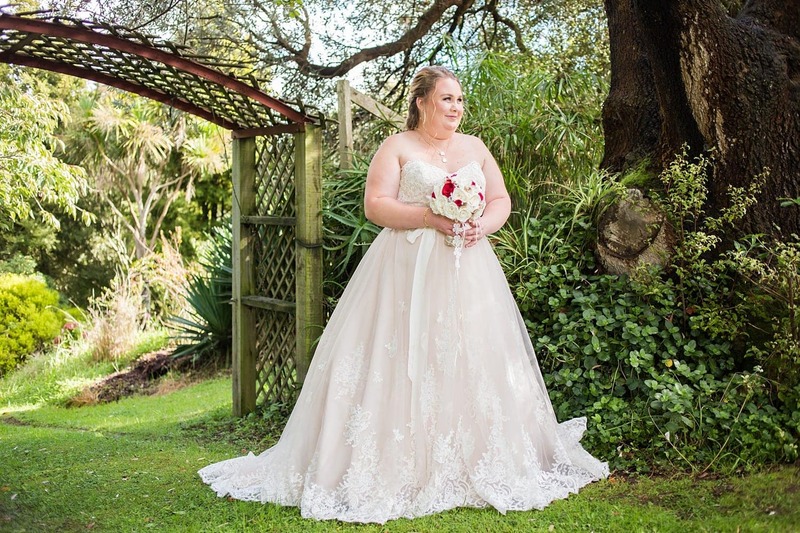 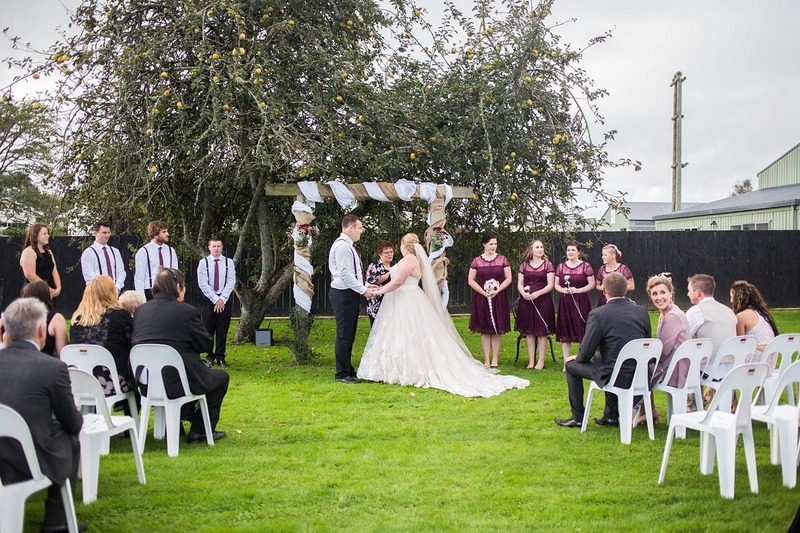 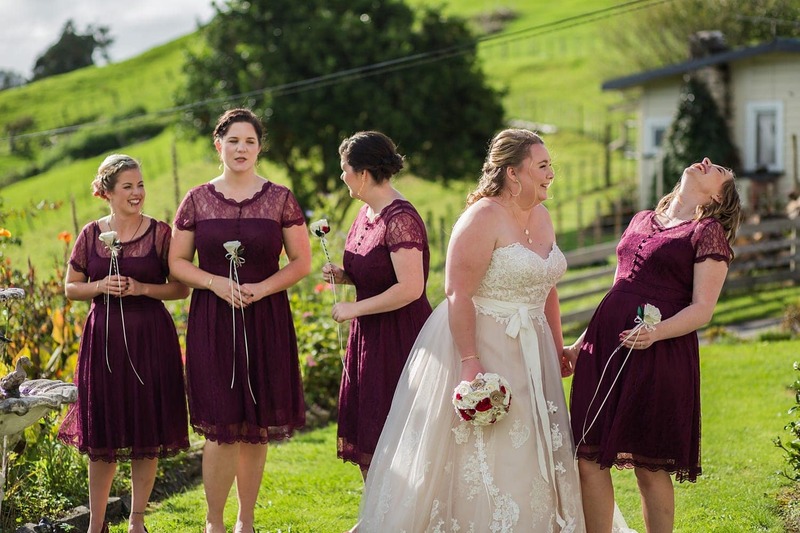 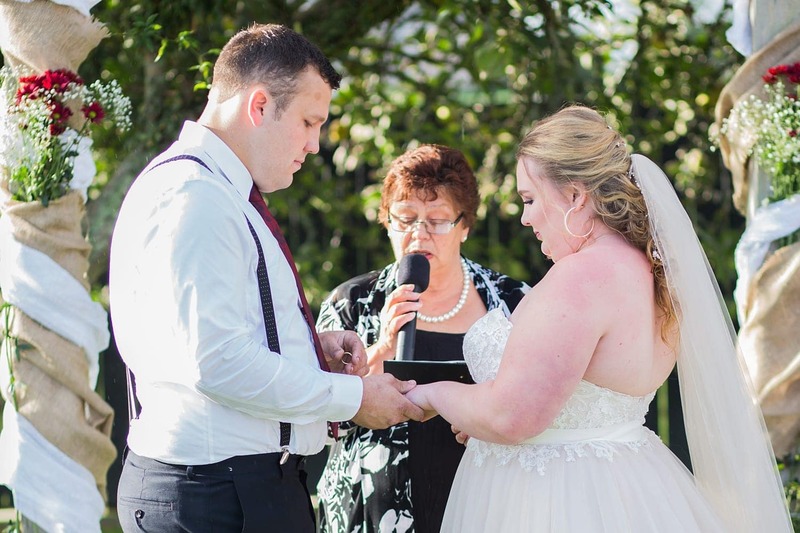 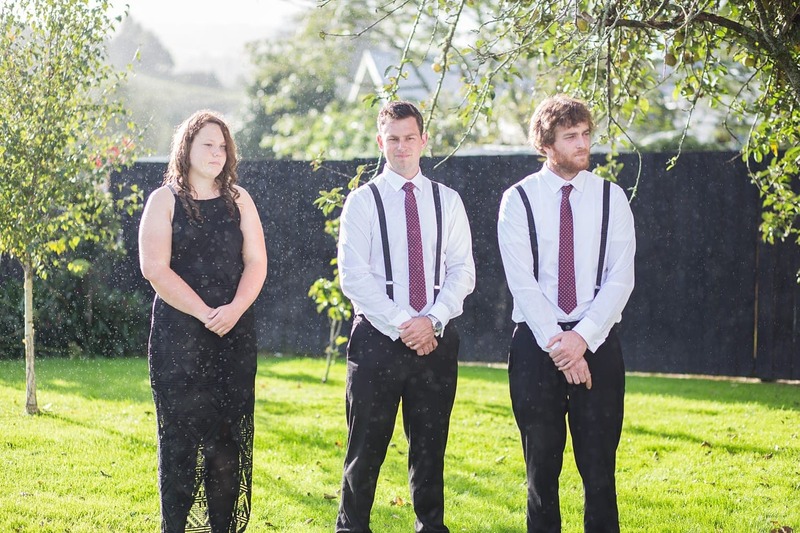 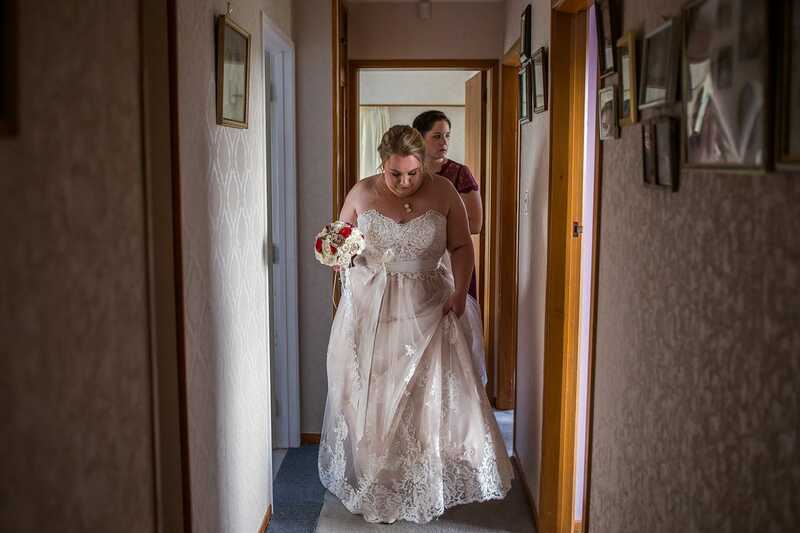 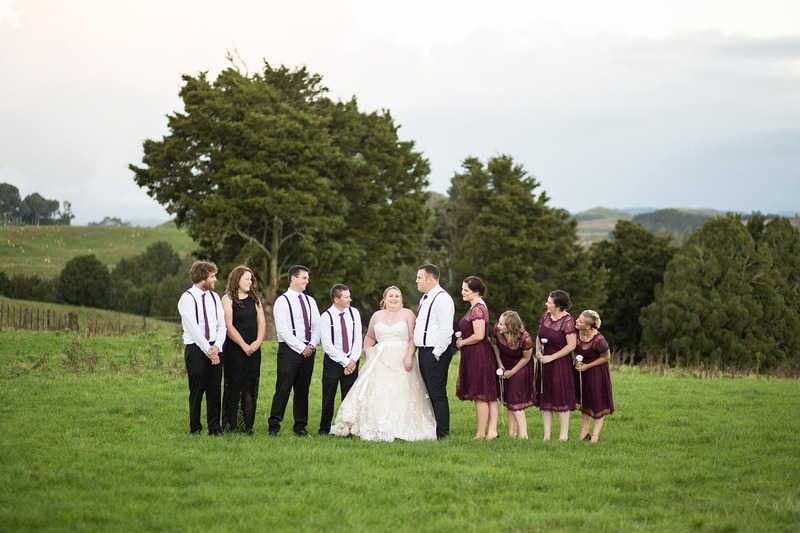 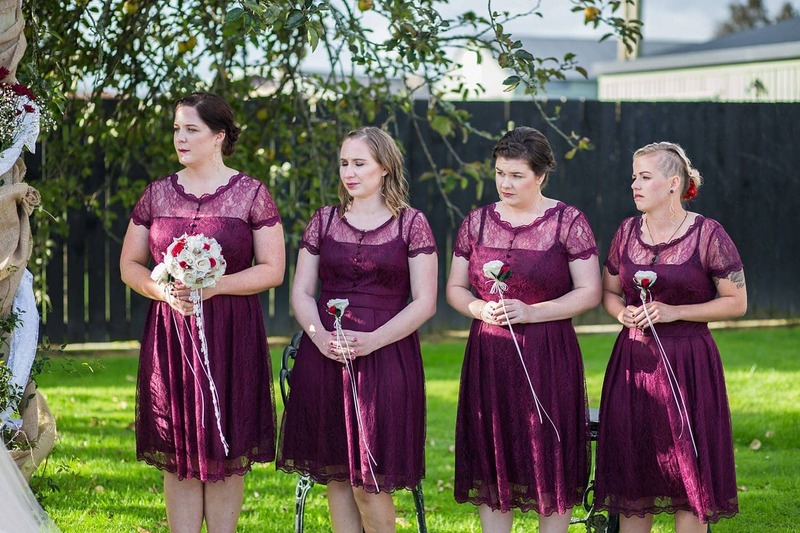 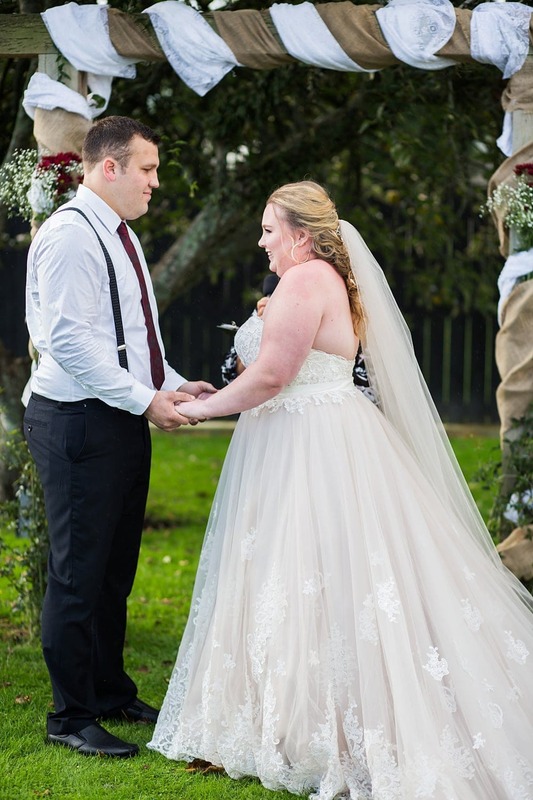 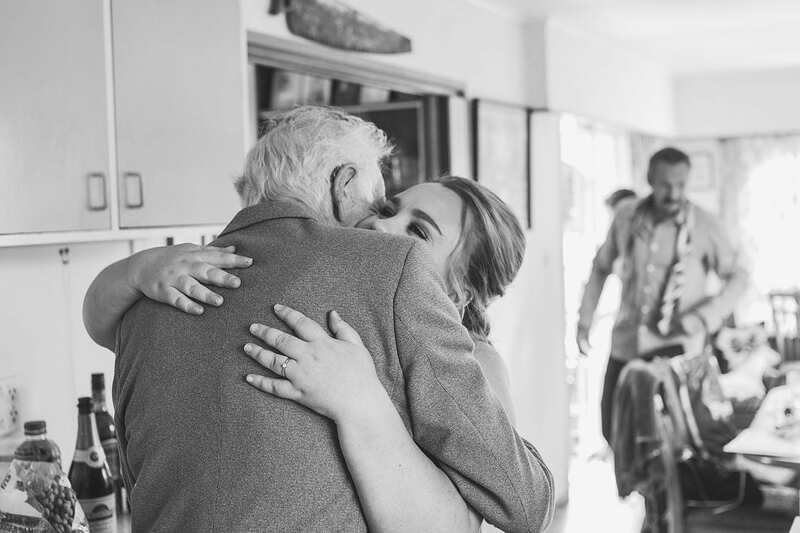 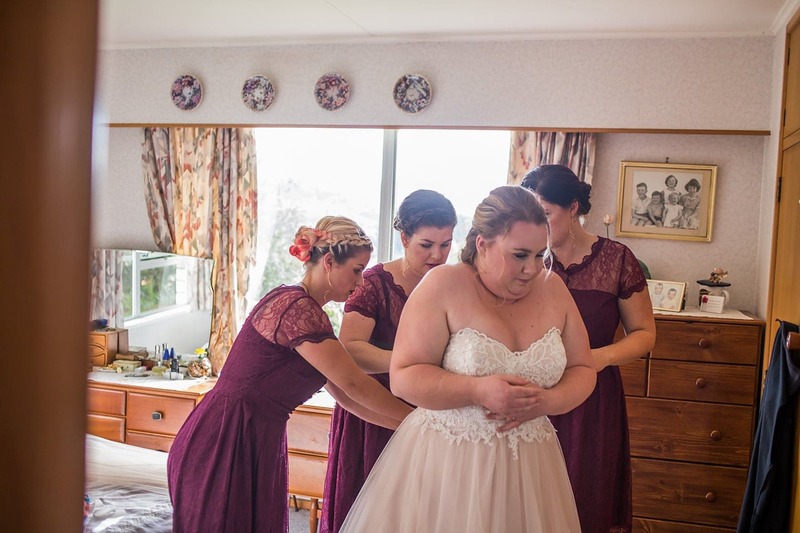 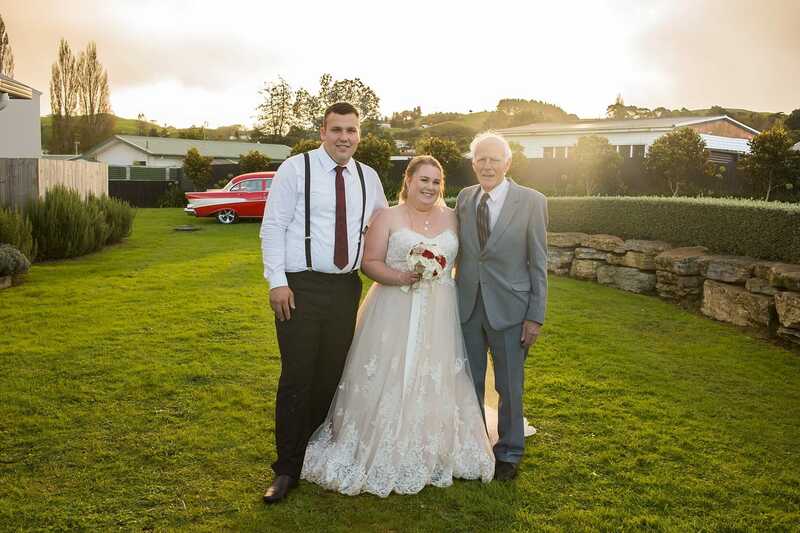 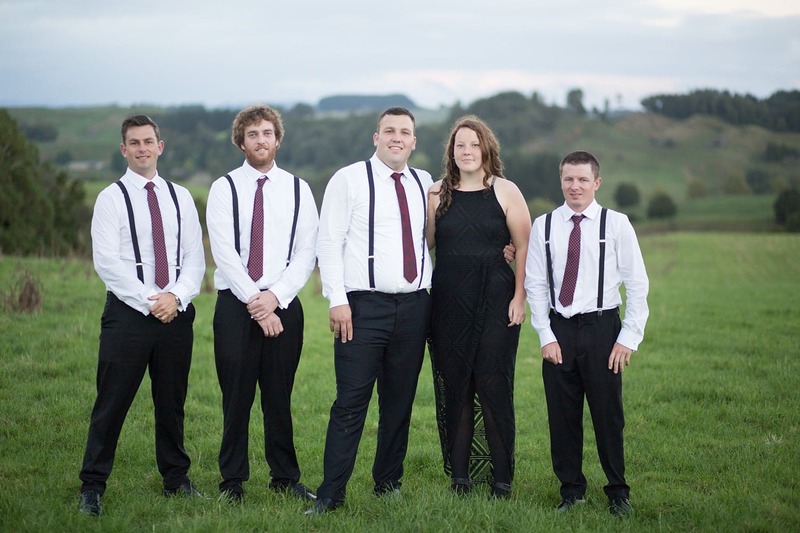 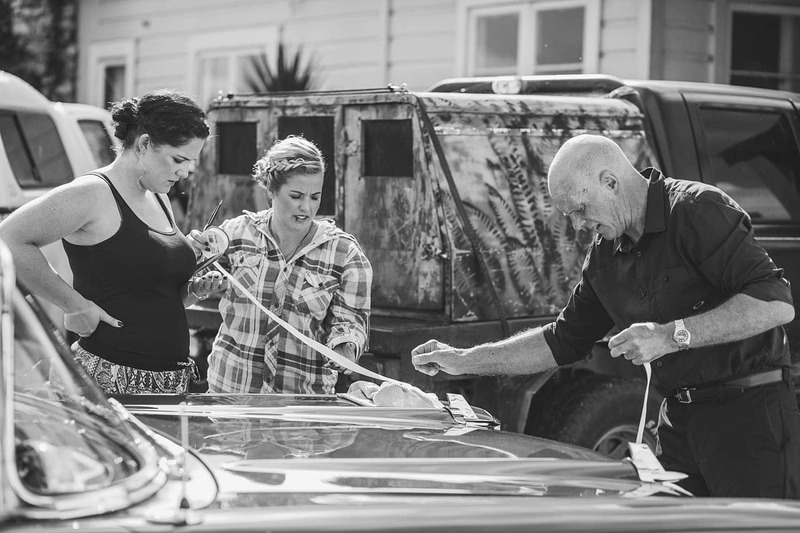 Their wedding was held over Easter weekend in early autumn following a massive week of stormy weather. 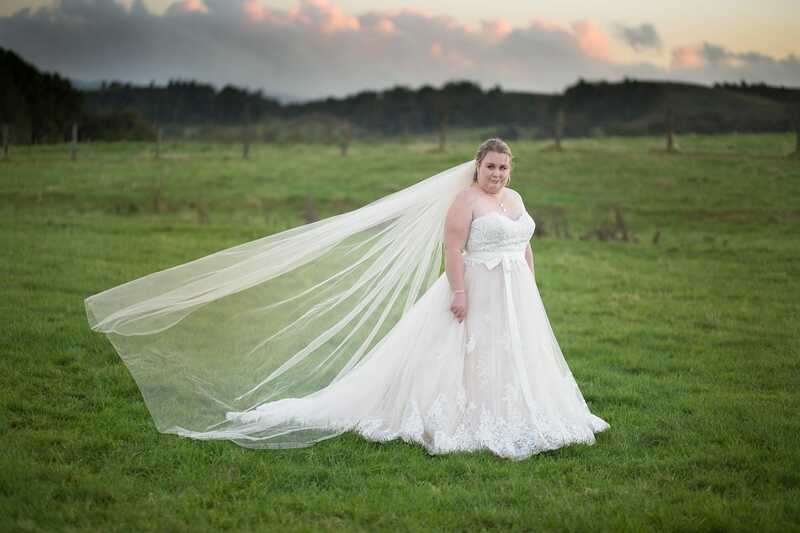 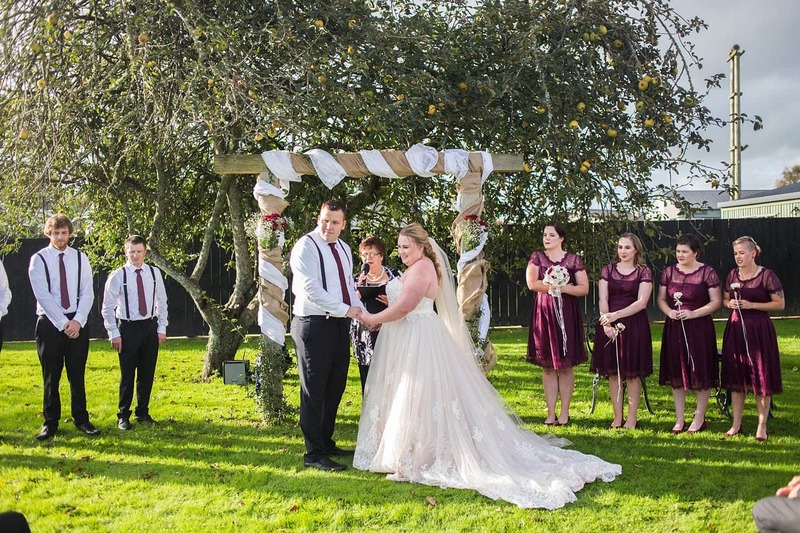 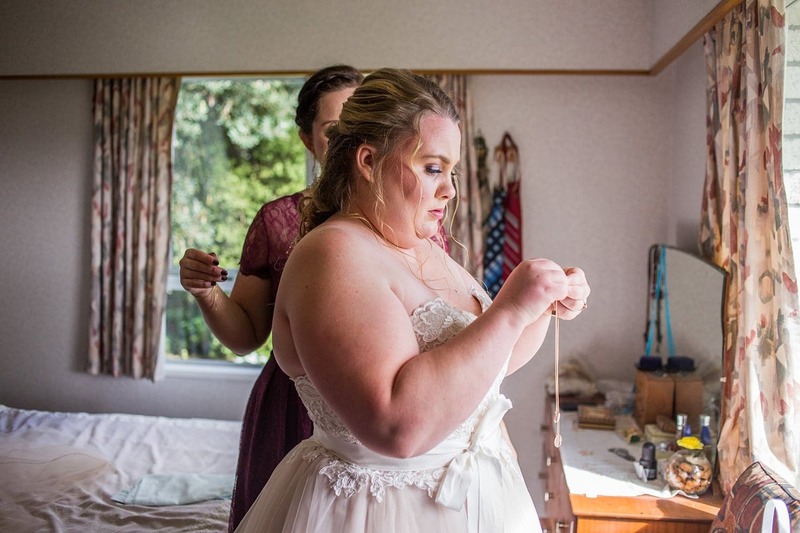 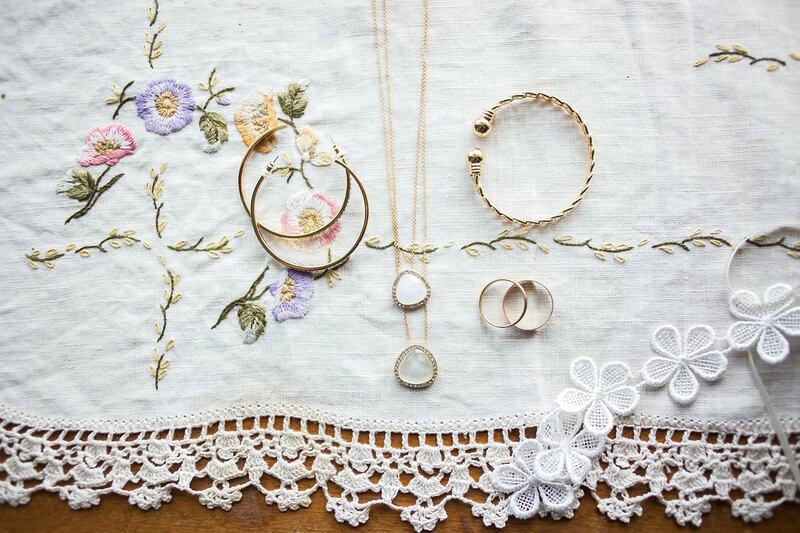 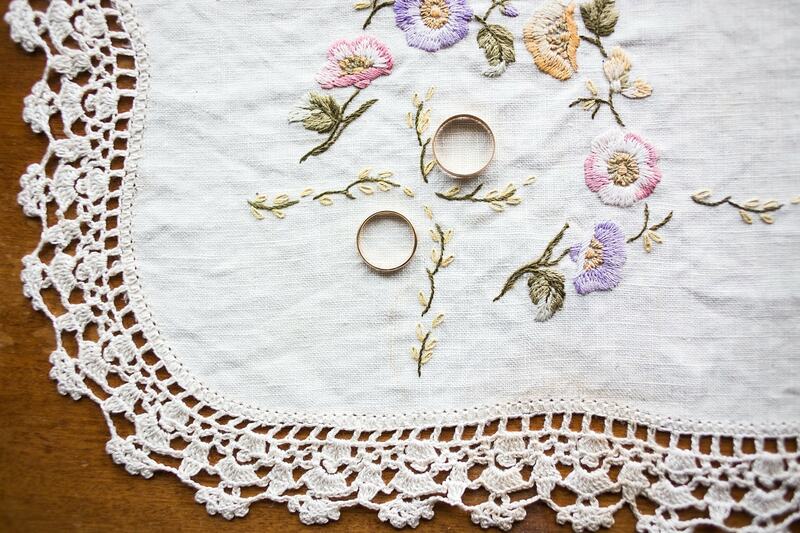 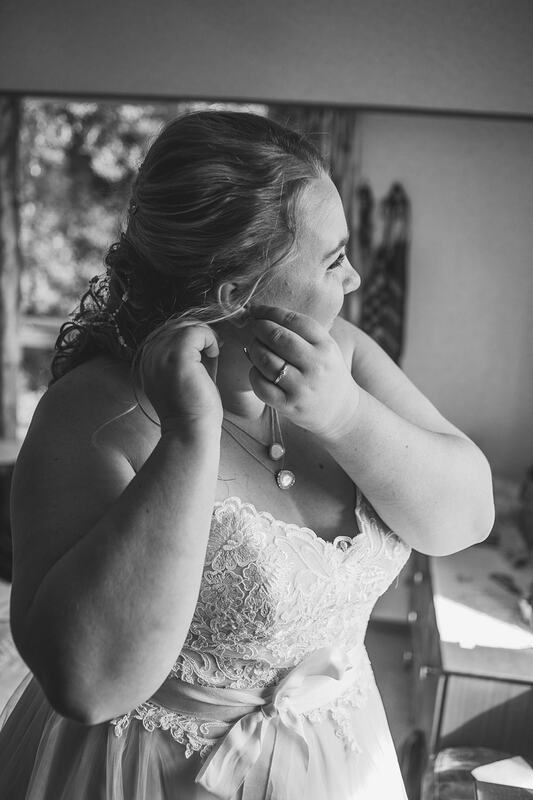 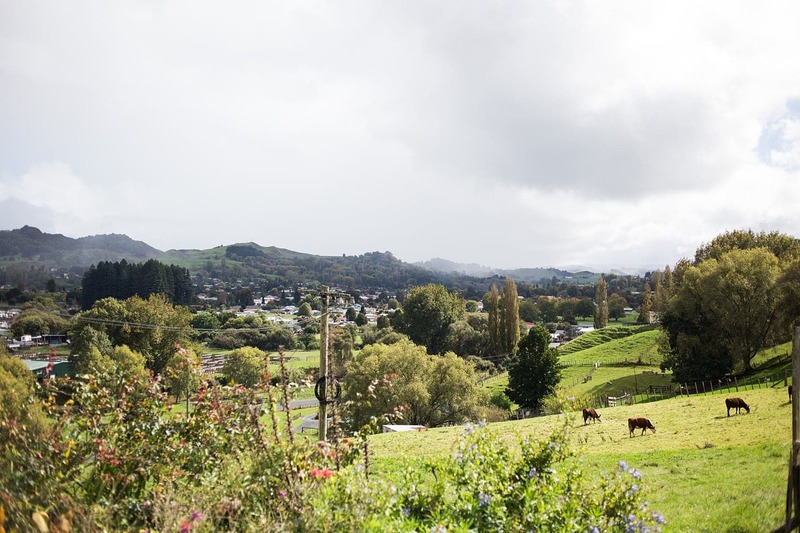 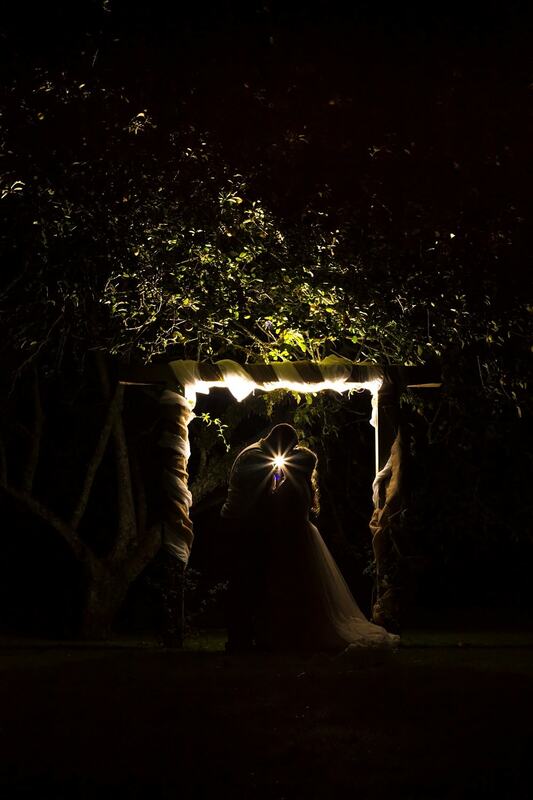 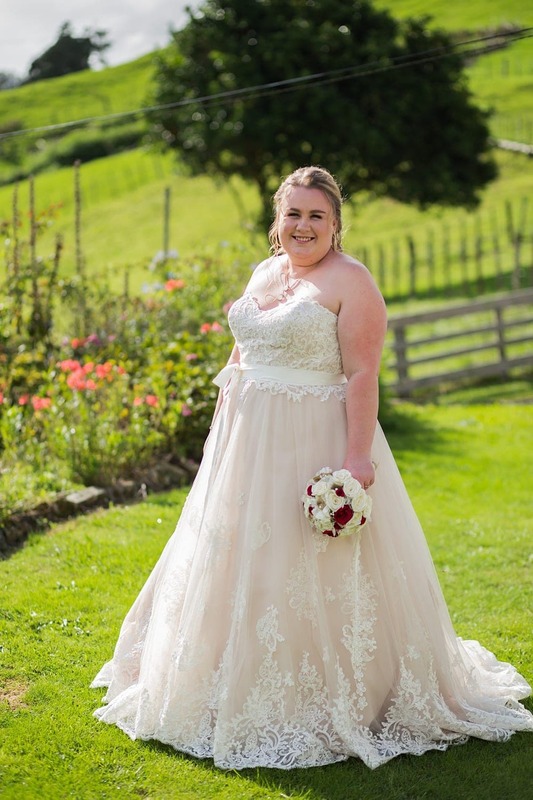 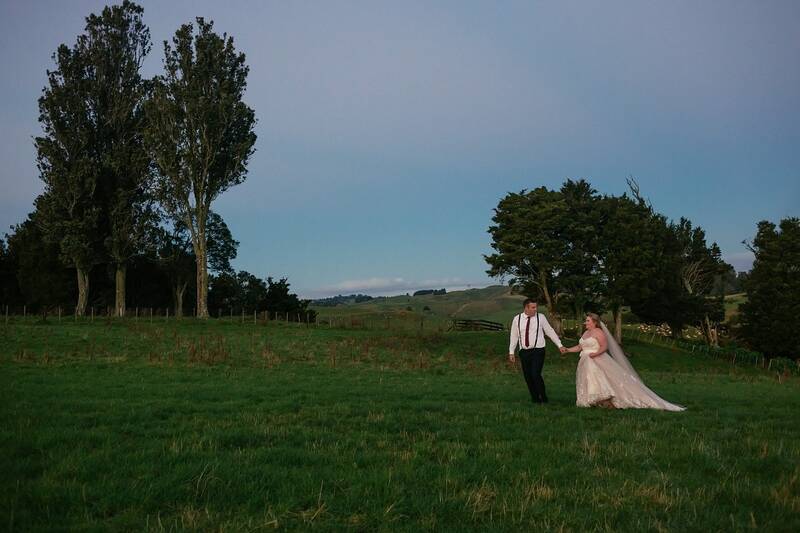 The plan was to marry in a stunning meadow through a gorgeous glade on a private farm in Piopio with scenery that featured in the lord of the rings movies. 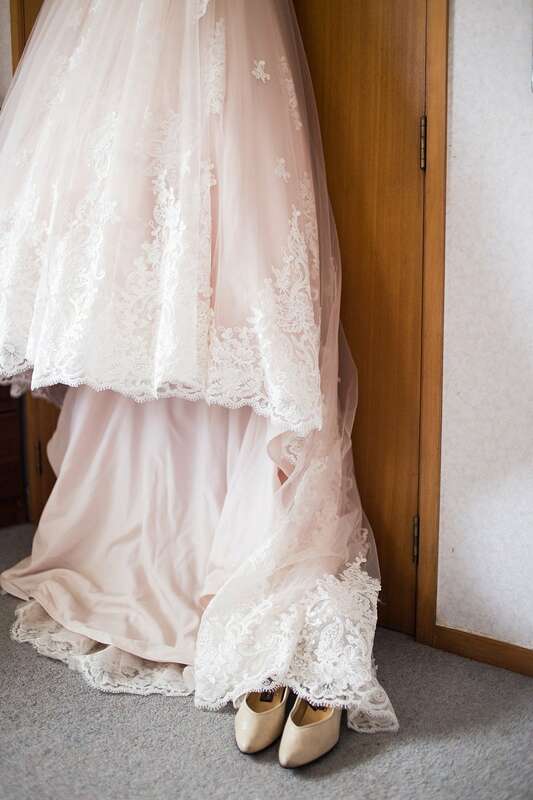 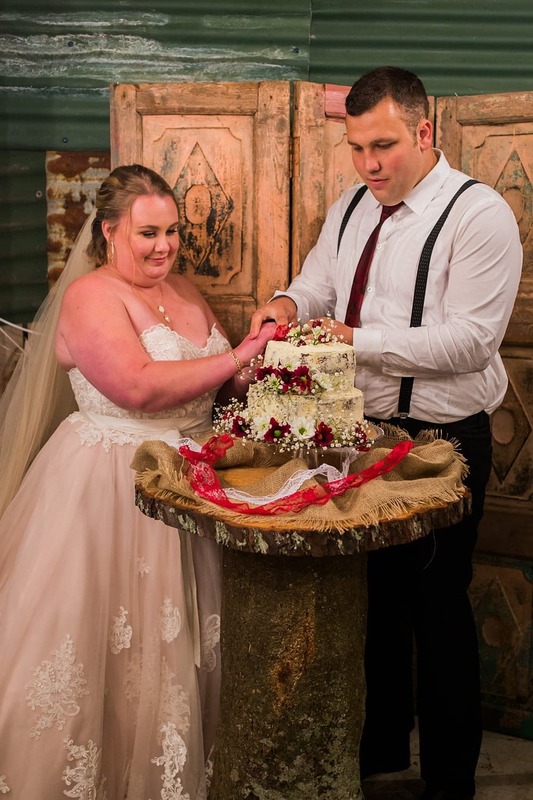 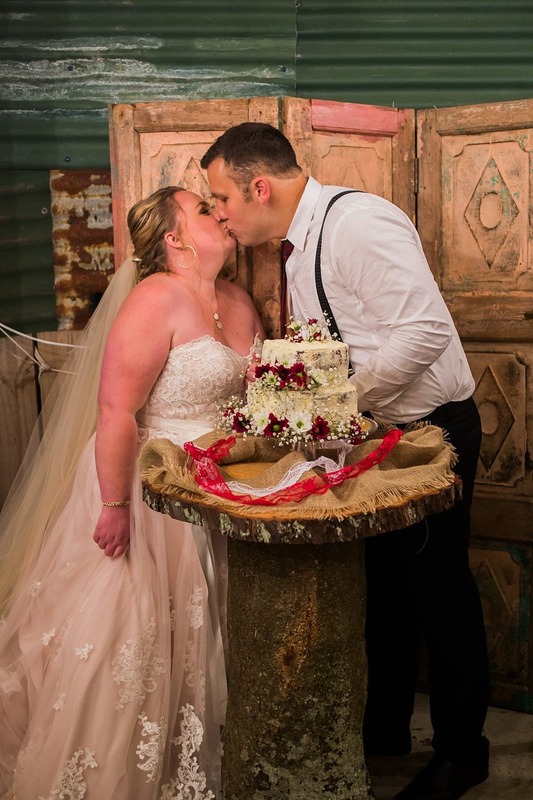 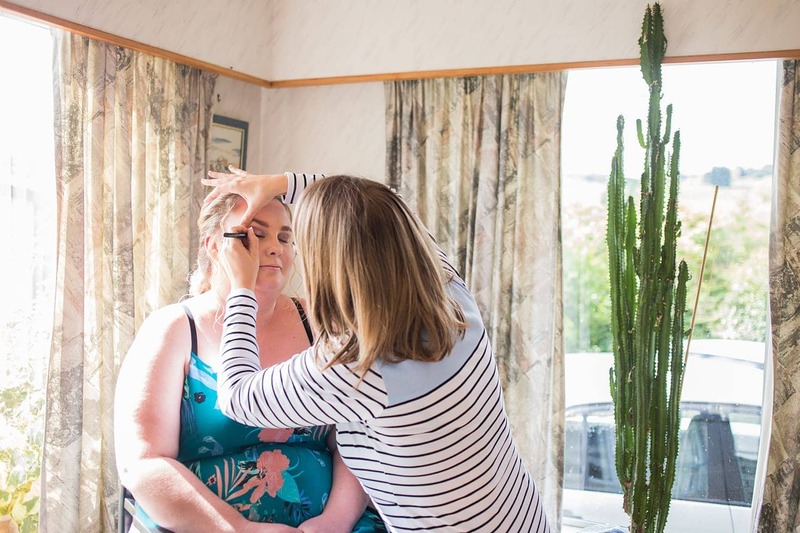 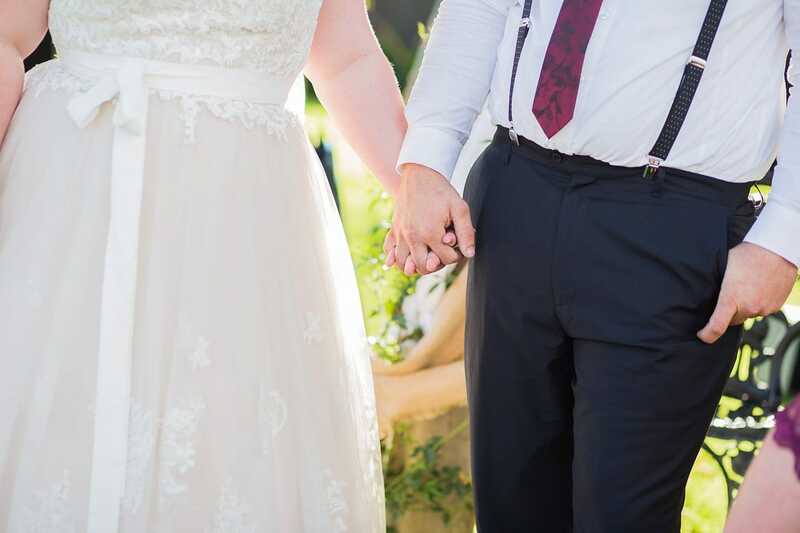 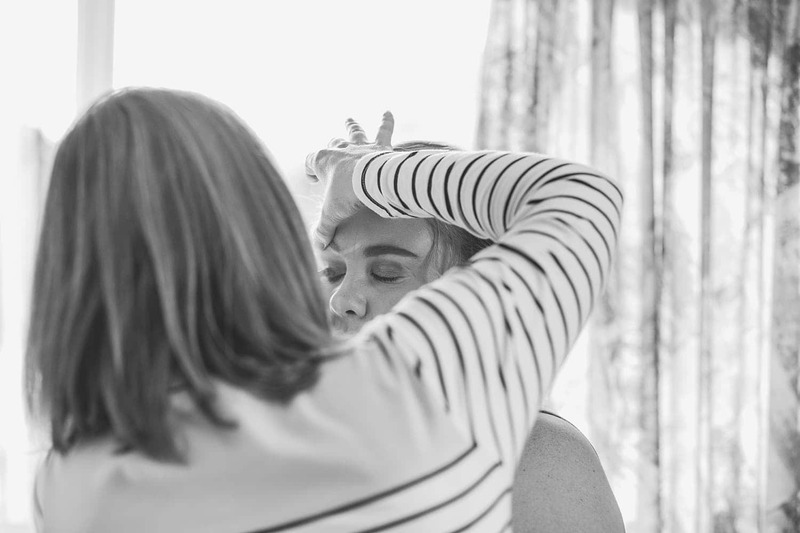 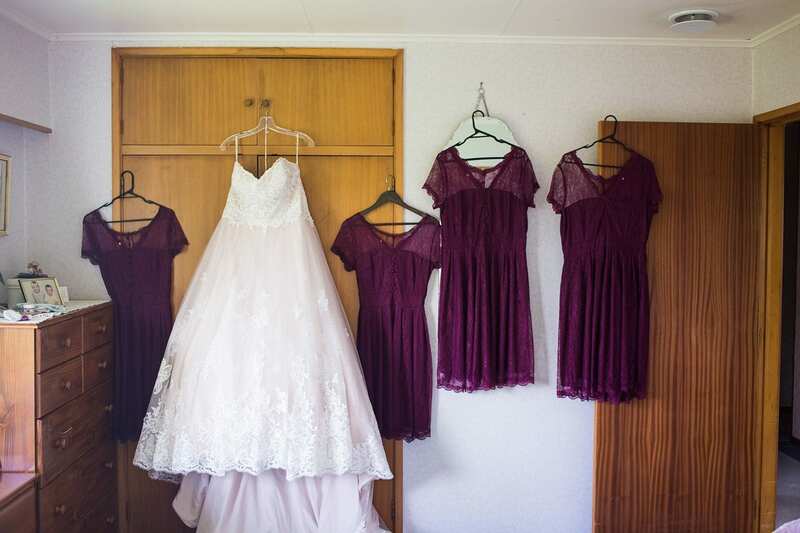 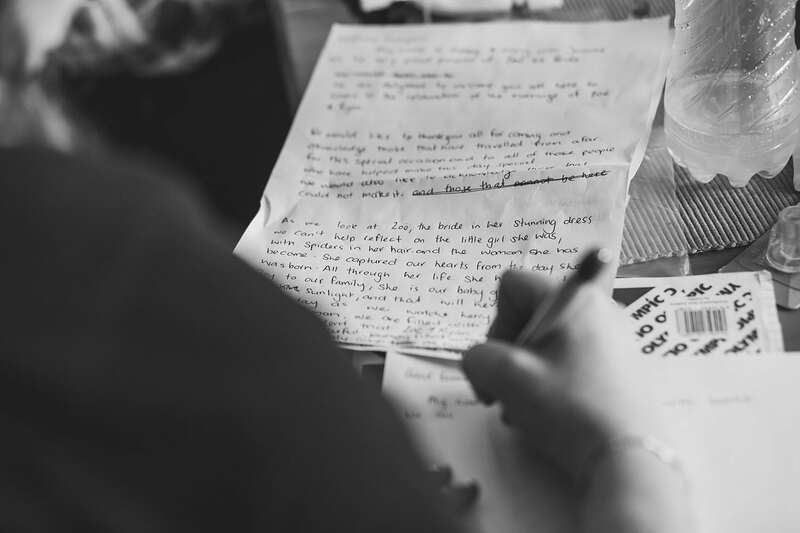 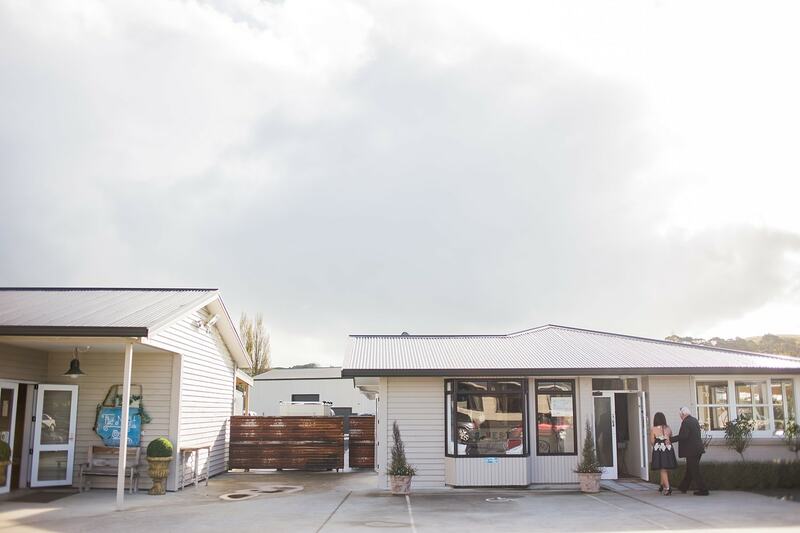 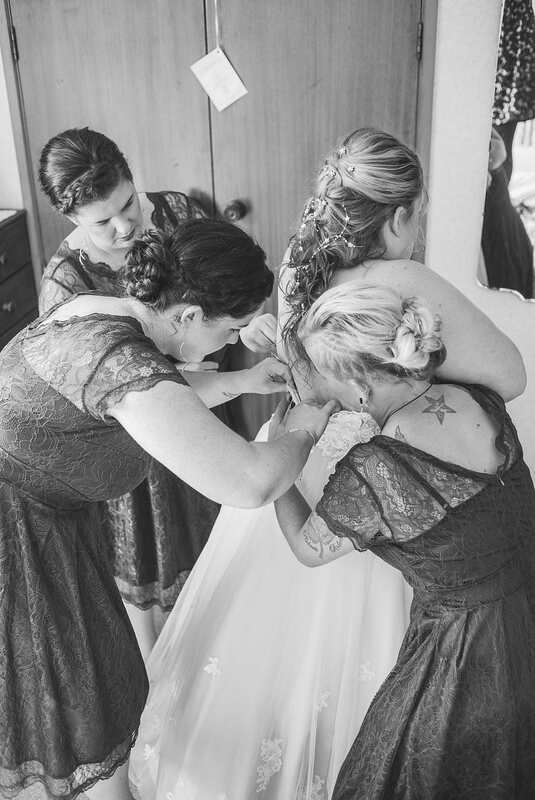 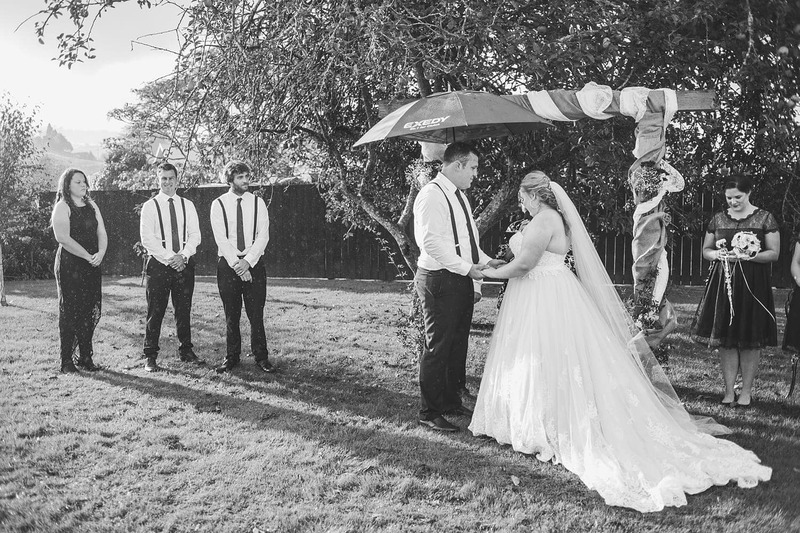 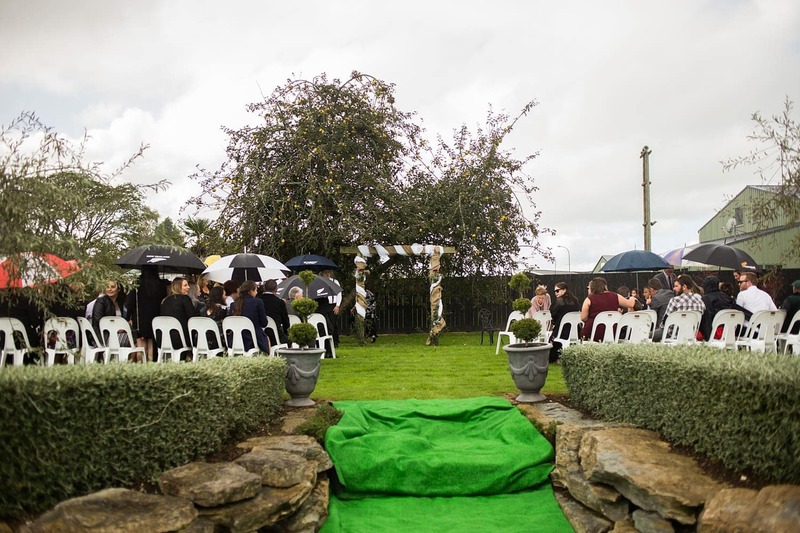 Everything was organised, and in the days leading up to their wedding, they found that the spot that they had planned to use had been flooded out and was unusable. 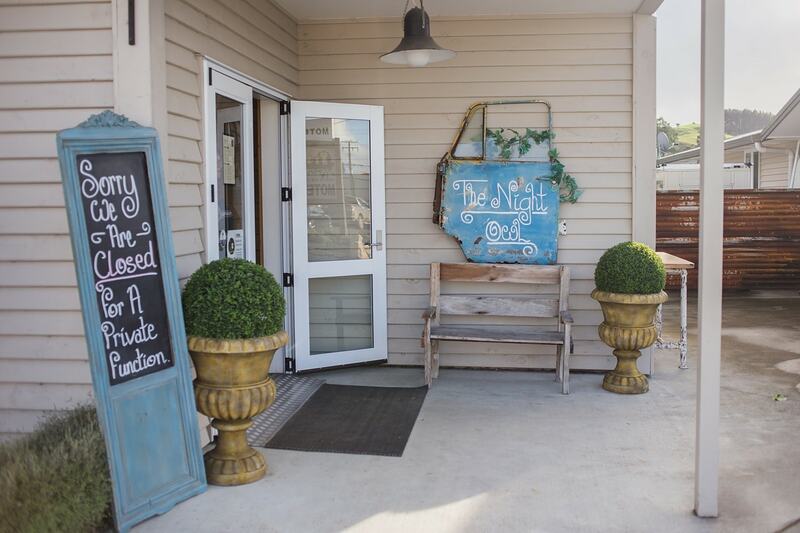 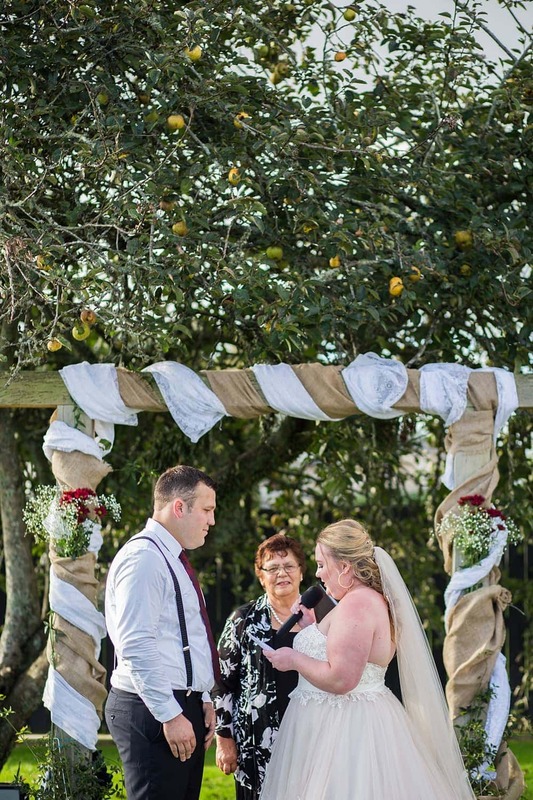 Not to be discouraged they found another very cool spot under a beautiful apple tree at The Night Owl which is where their reception was planned for anyway. 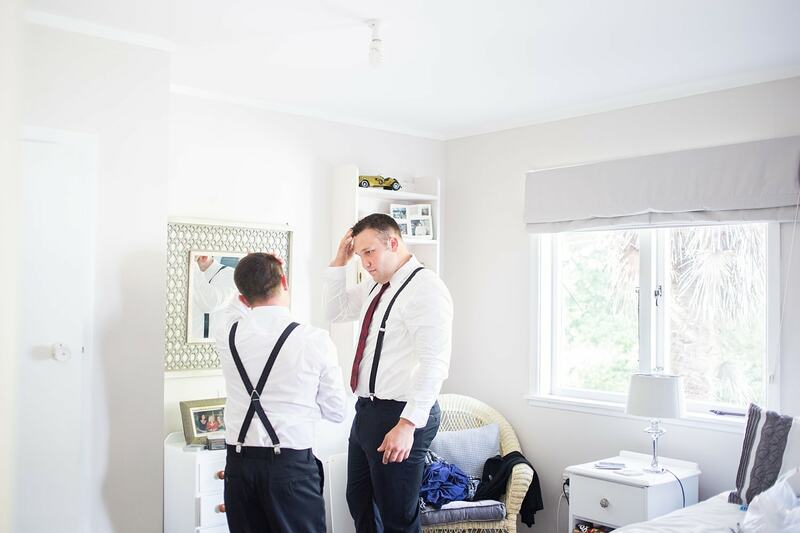 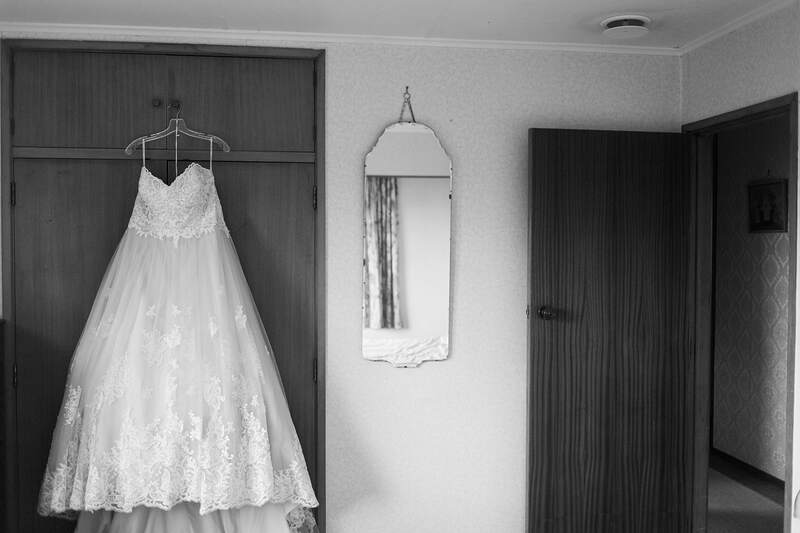 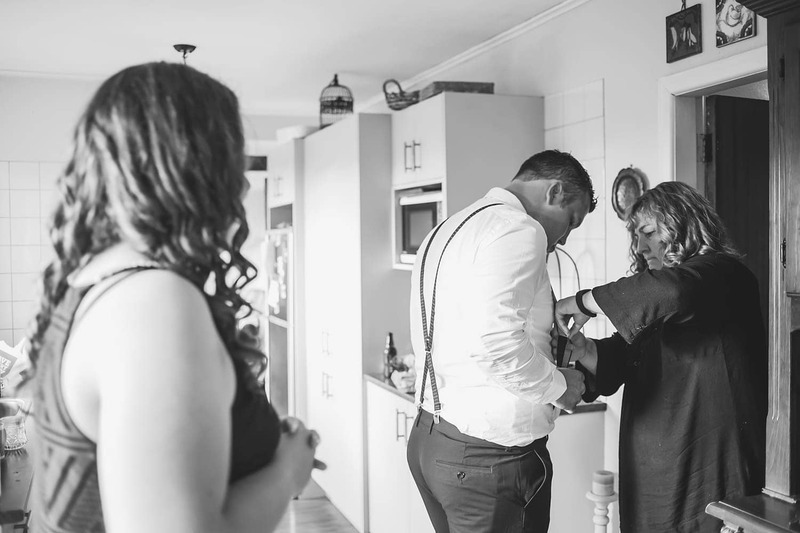 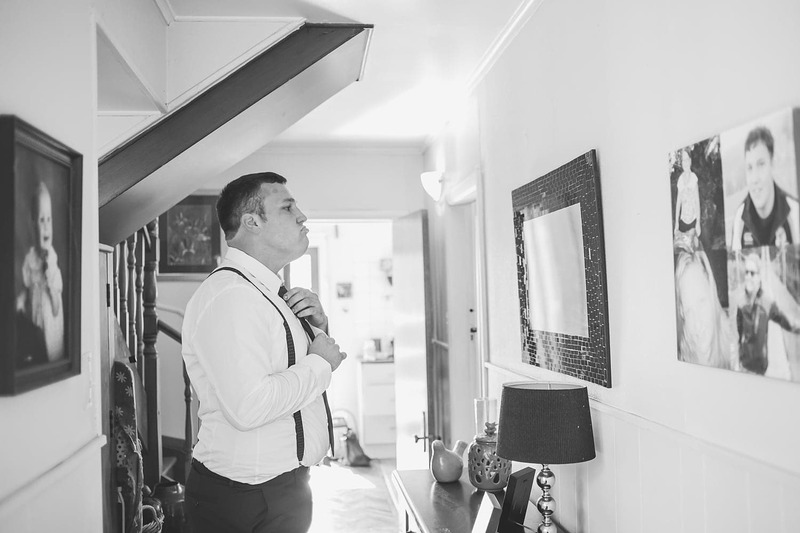 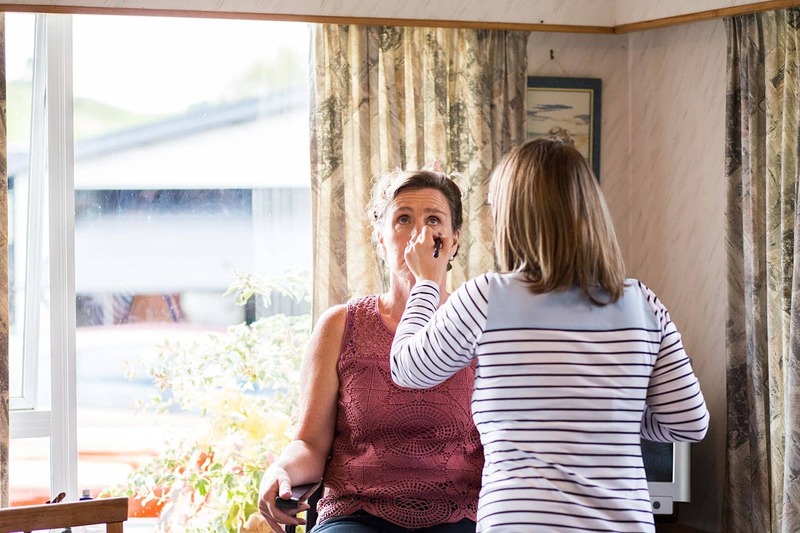 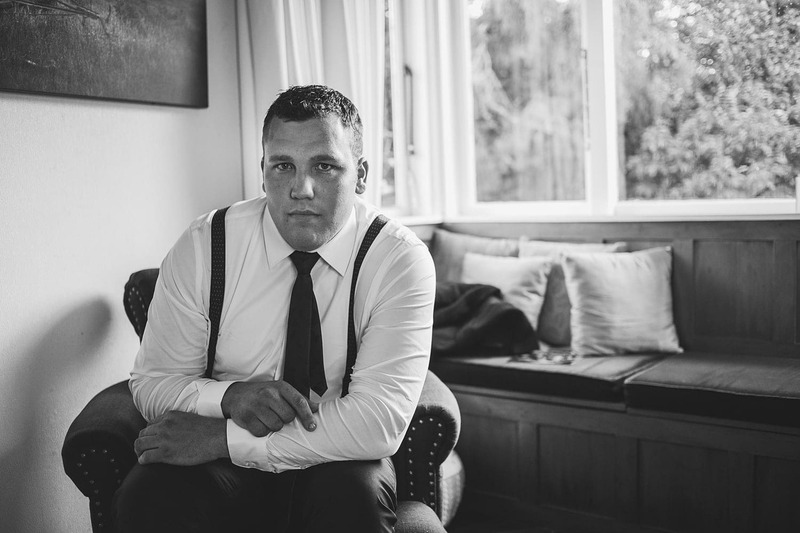 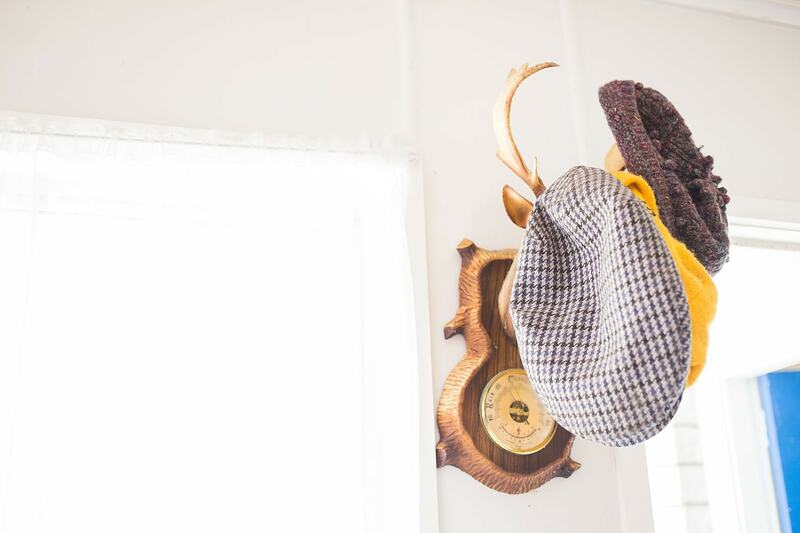 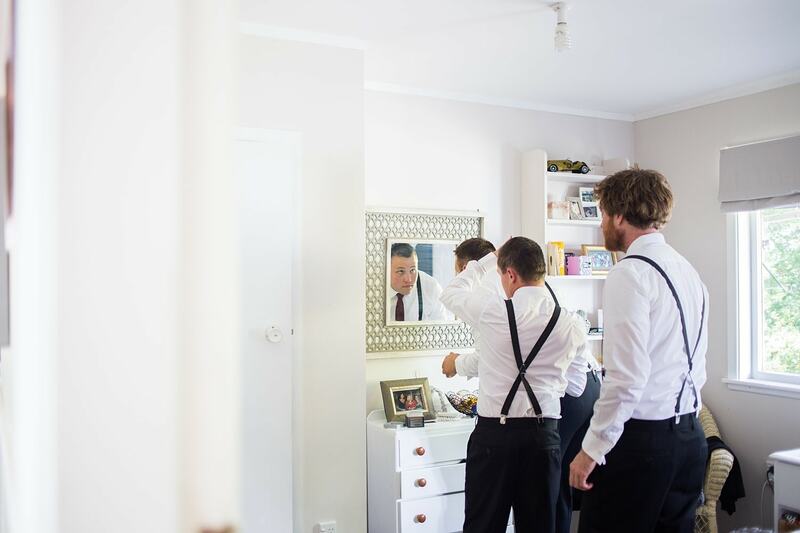 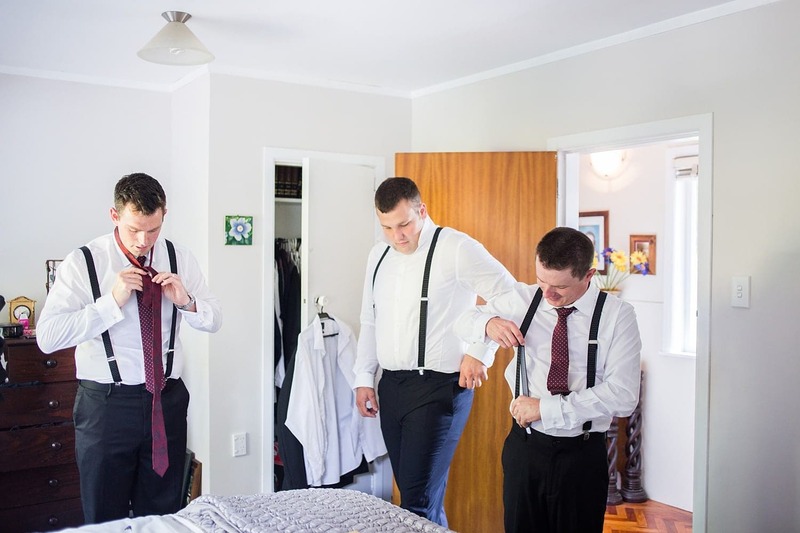 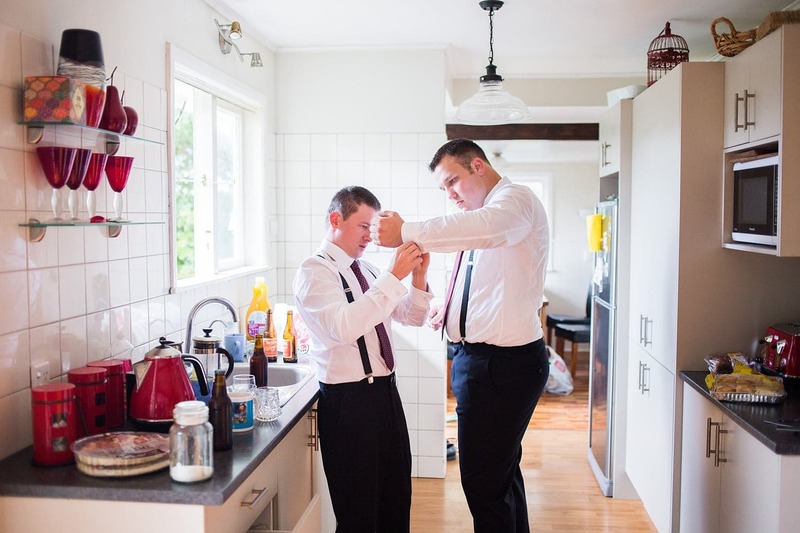 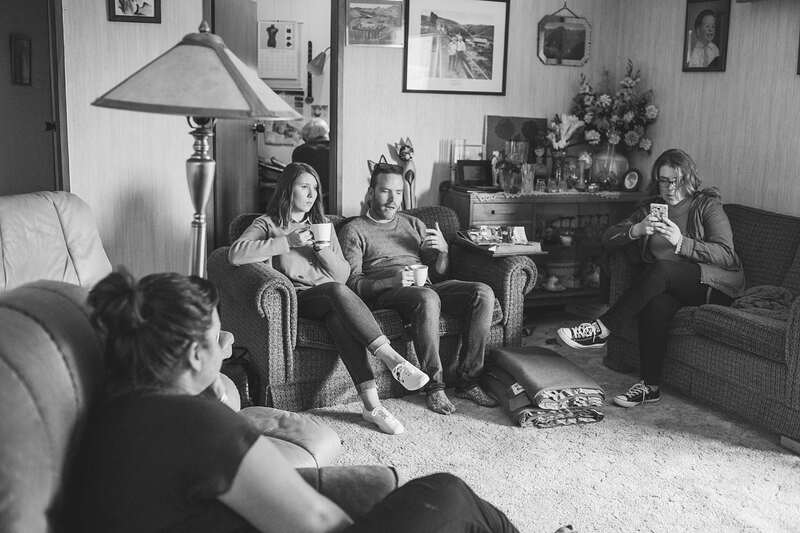 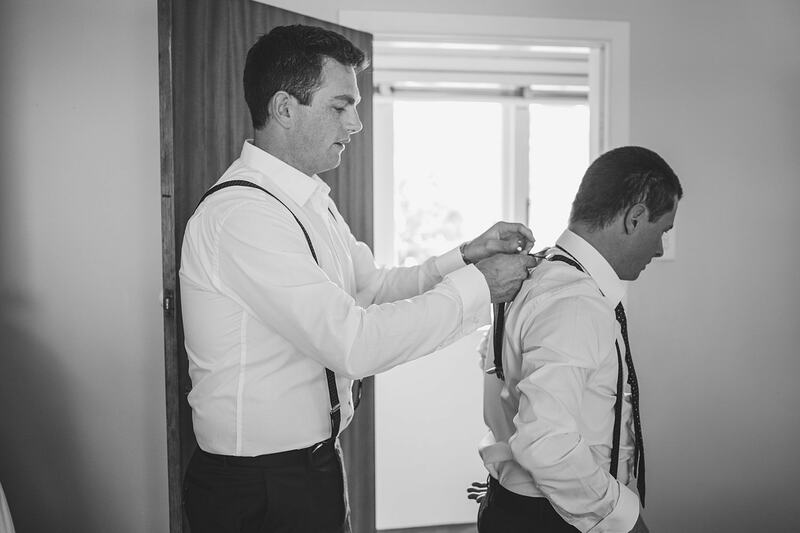 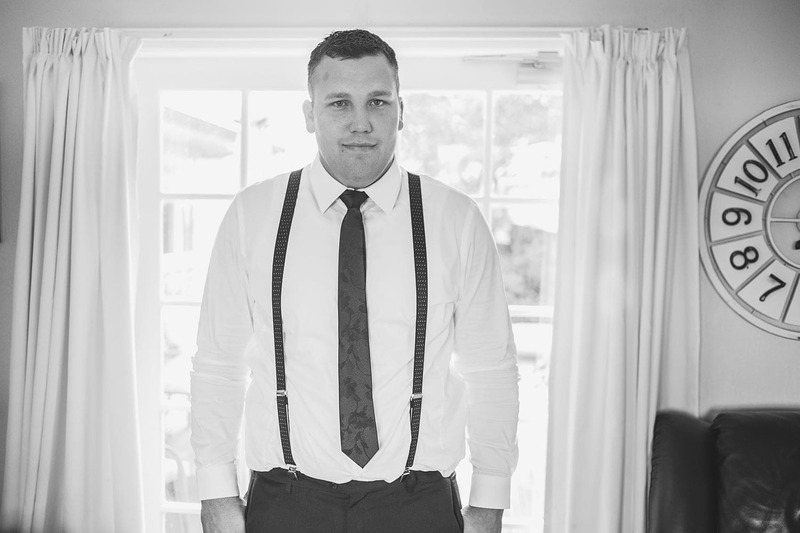 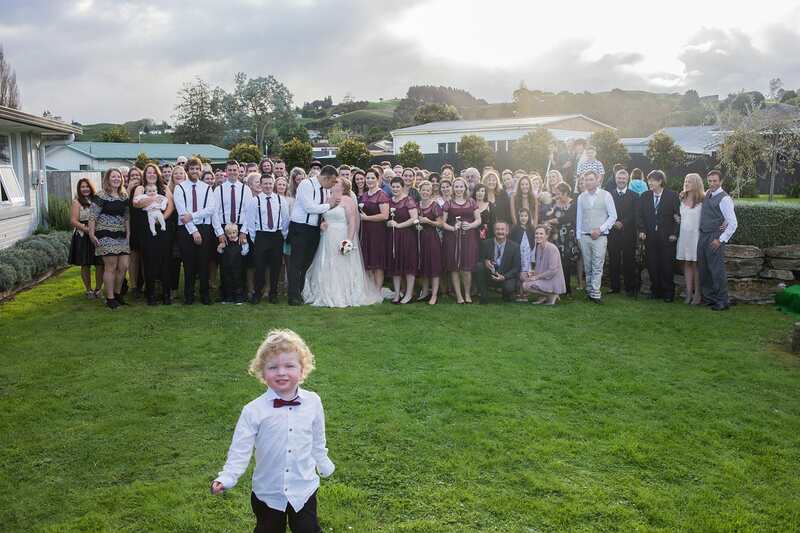 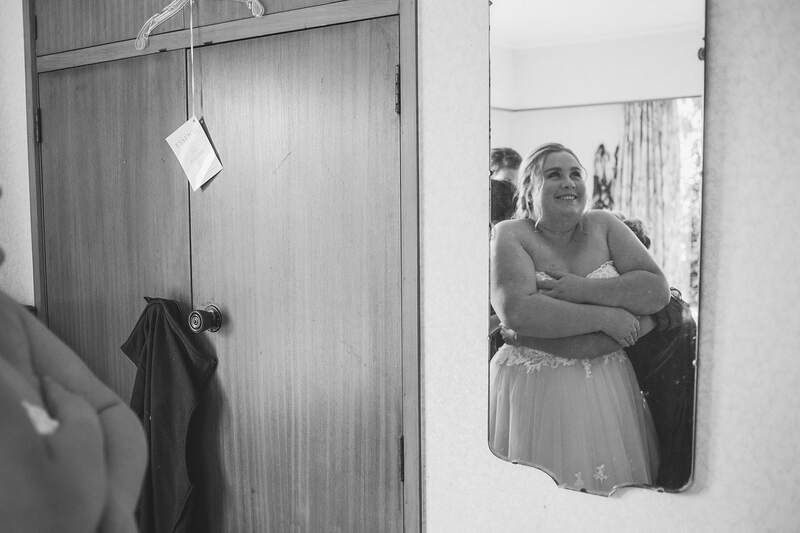 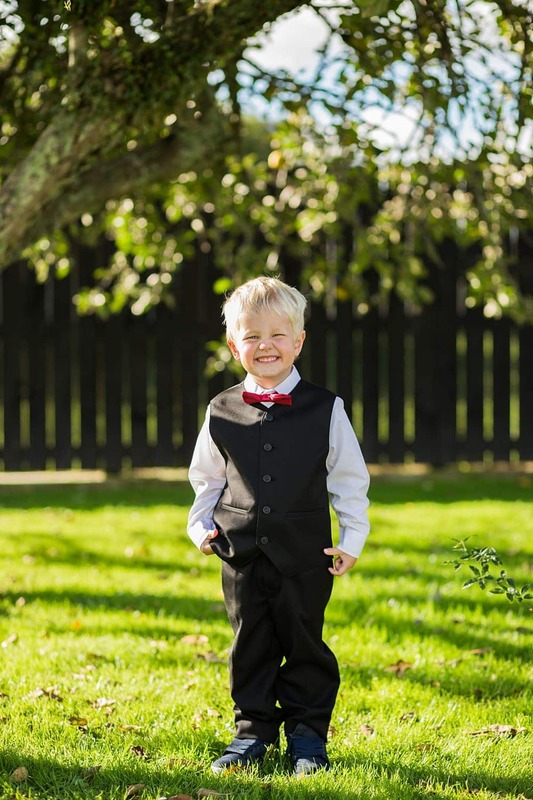 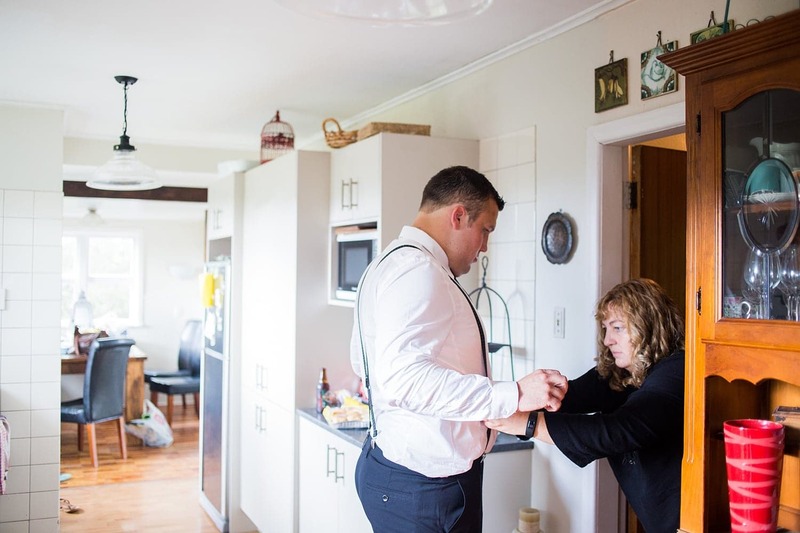 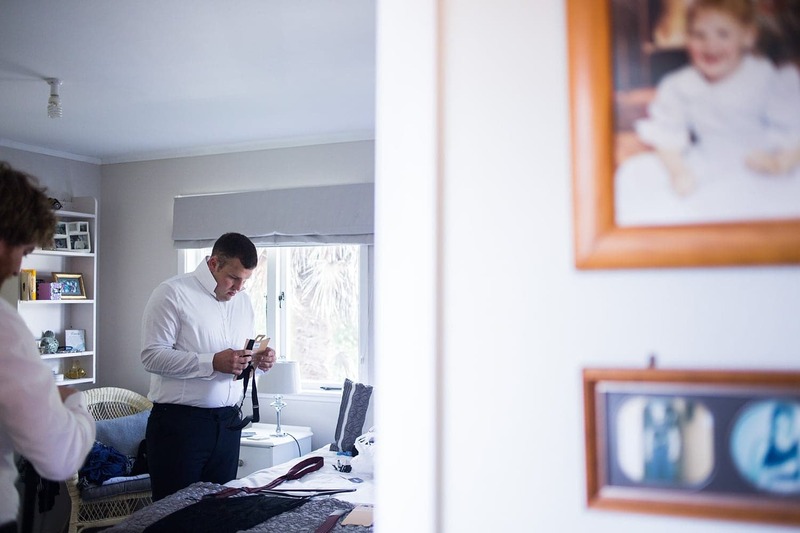 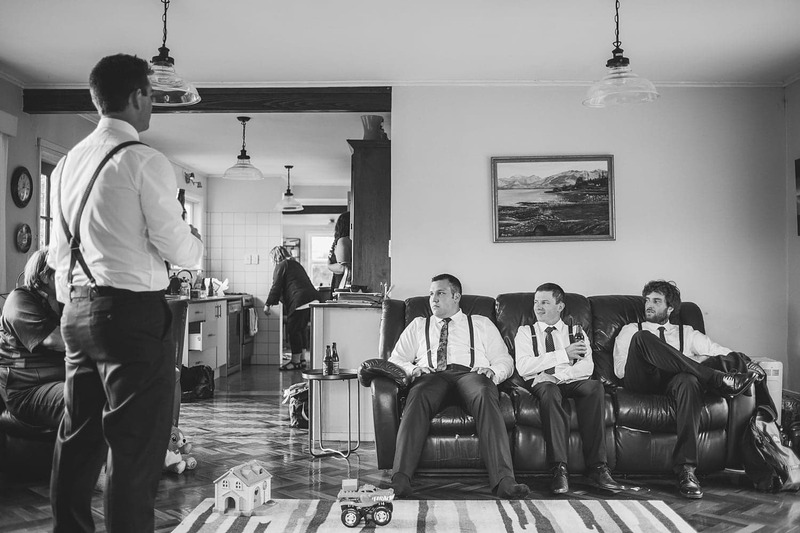 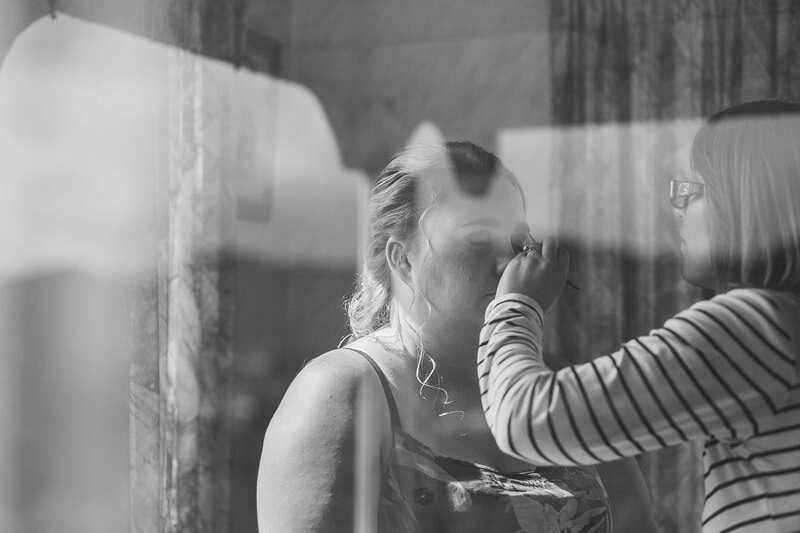 Ryan got ready at his family home surrounded by his groomsmen and groomslady. 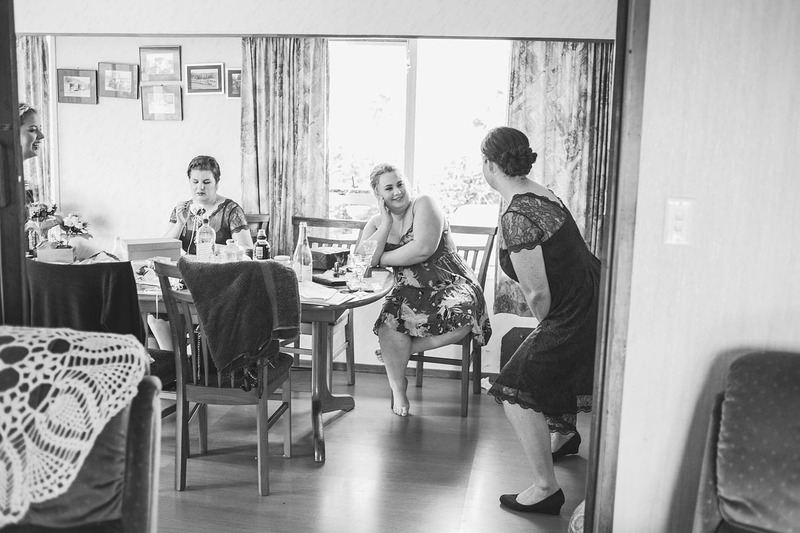 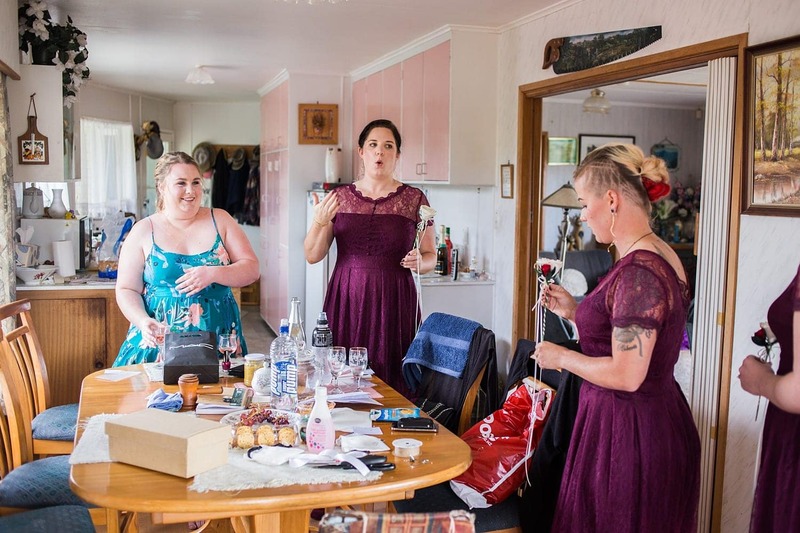 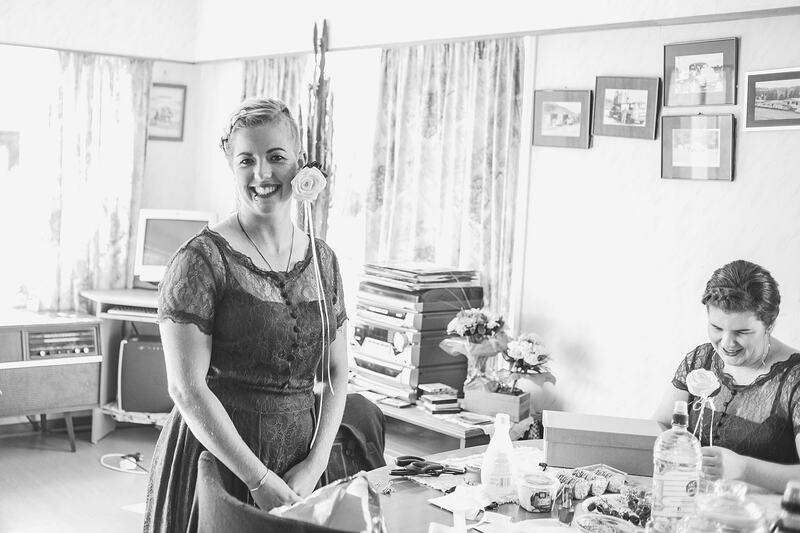 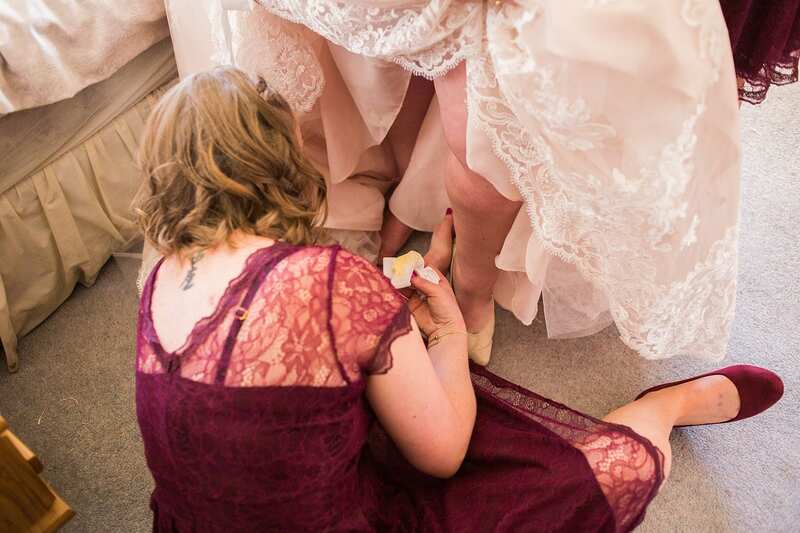 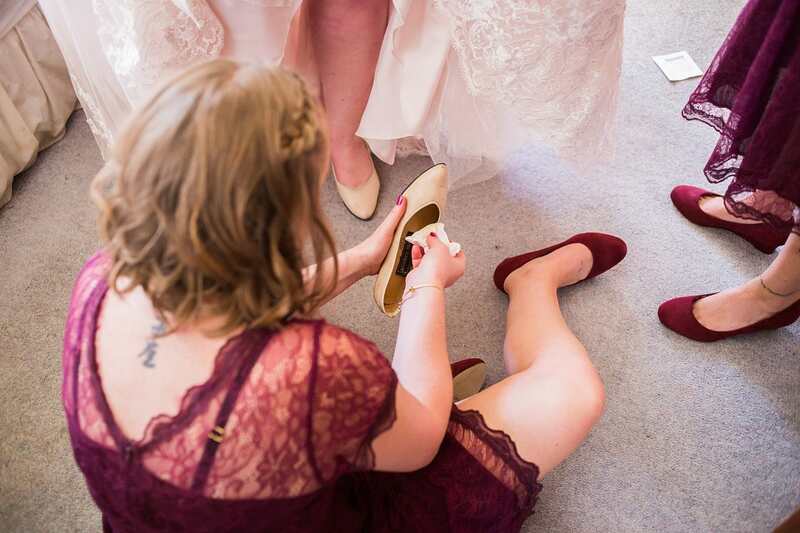 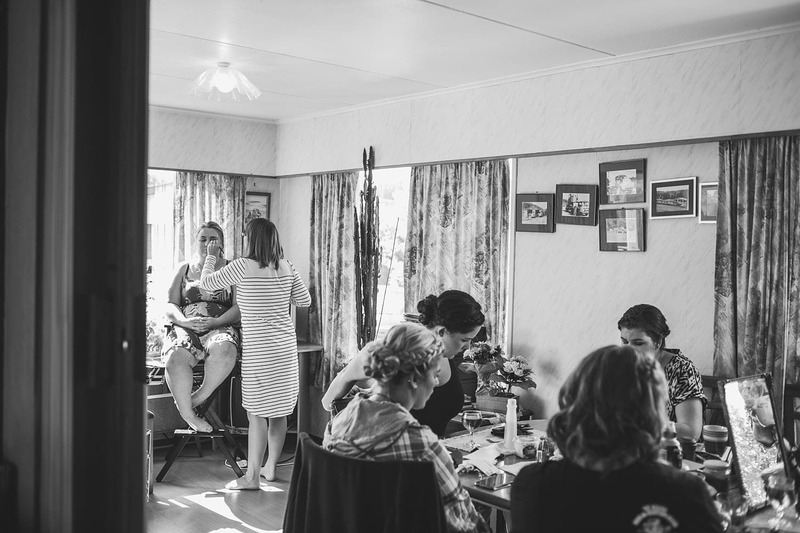 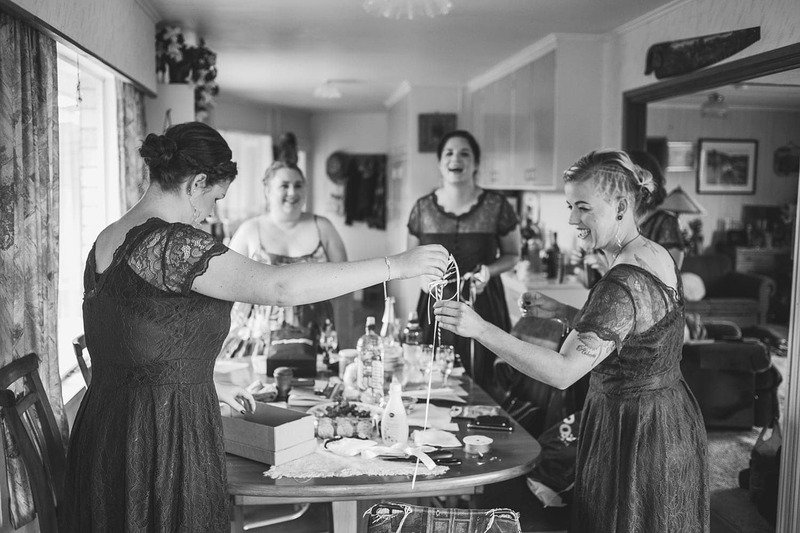 Getting ready at her grandad’s house Zoe and her bridesmaids were so relaxed, even when Zoe’s shoes didn’t quite go on as easily as hoped (they were her mum’s wedding shoes, how cool is that?! 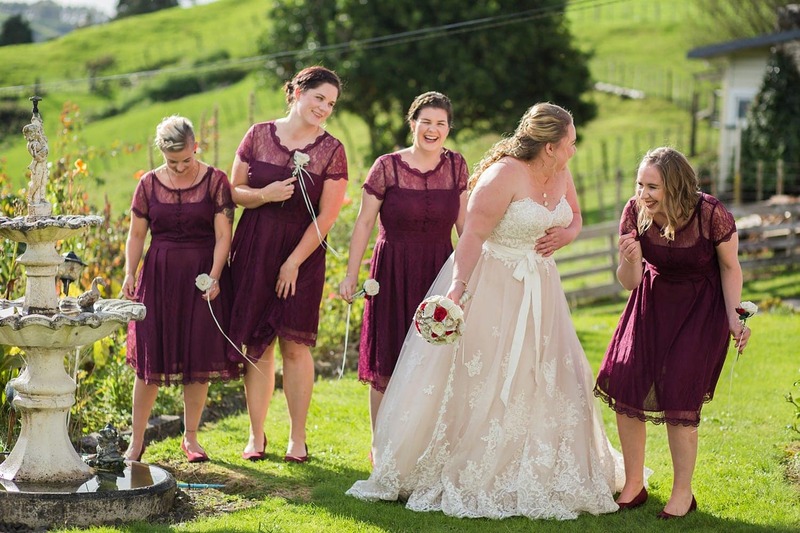 ), her sister whipped out some butter and on they went! 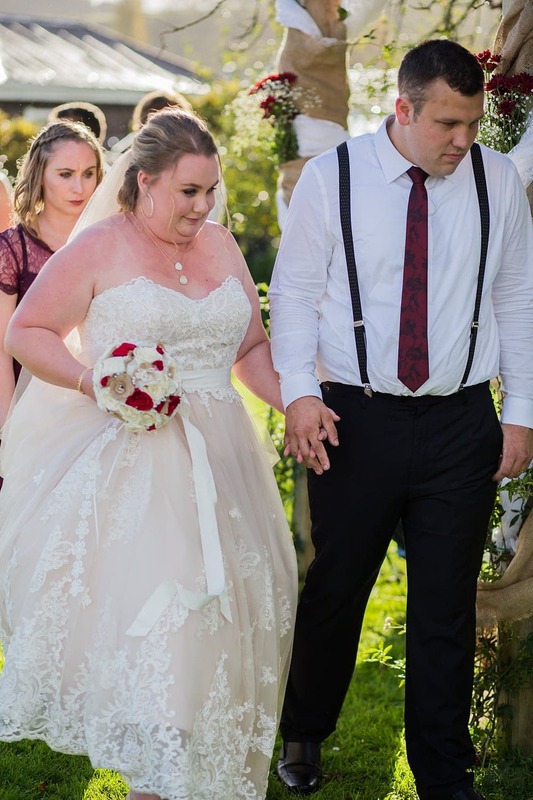 Definitely a first for me! 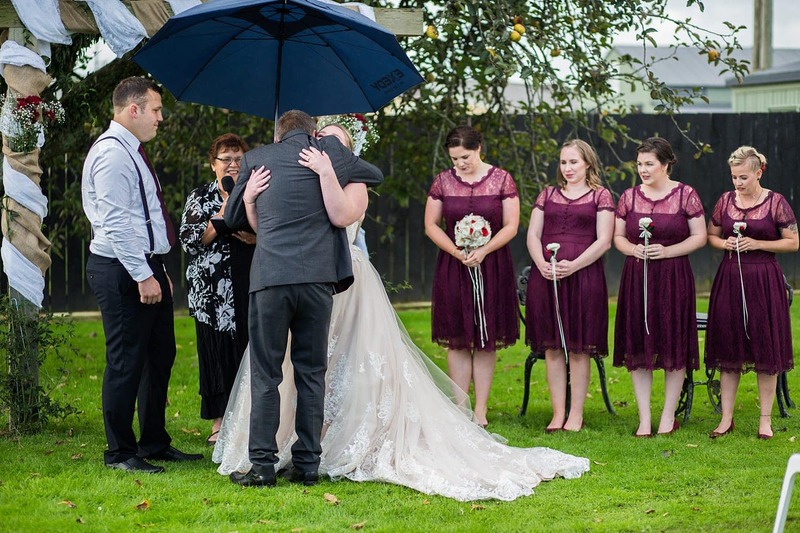 The moment Zoe stepped out of her awesome cherry red bridal car, a beautiful (but slightly unwelcome) mist like rain started coming down but luckily the bridal party was ready with umbrellas, and the rain actually made for some very pretty photos during the ceremony. 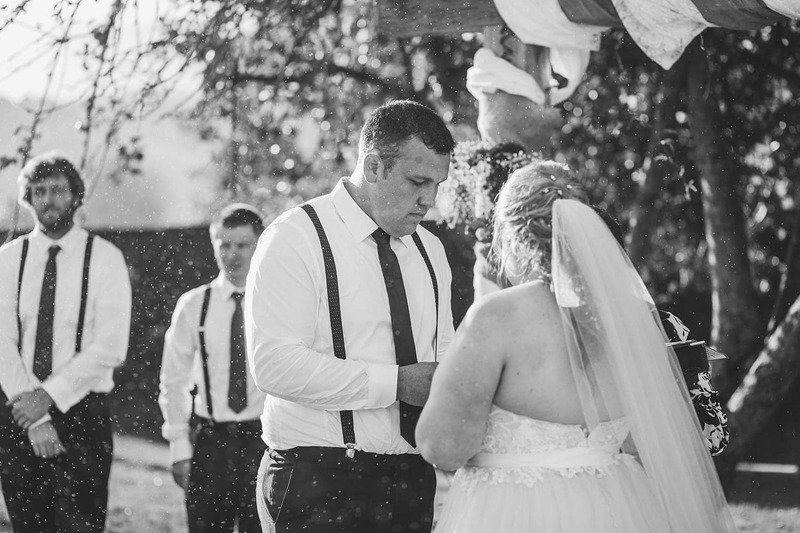 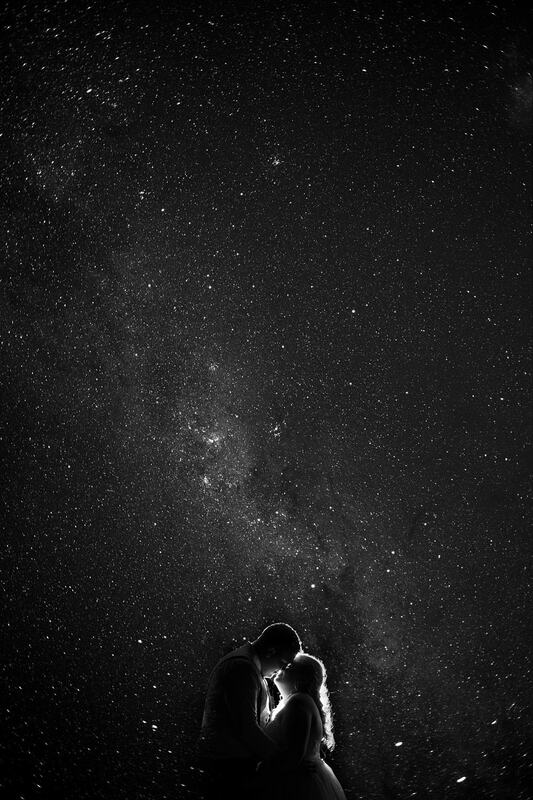 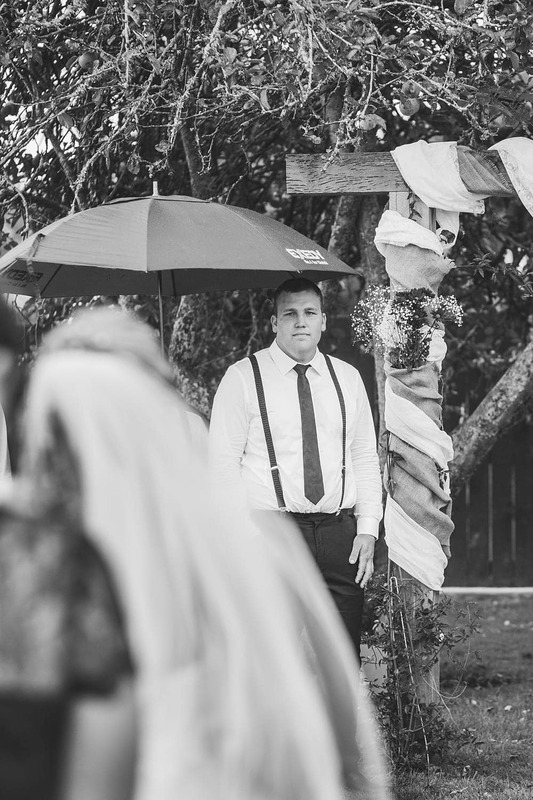 As they said their vows, the sun broke through the clouds and rain stopped in time for their first kiss. 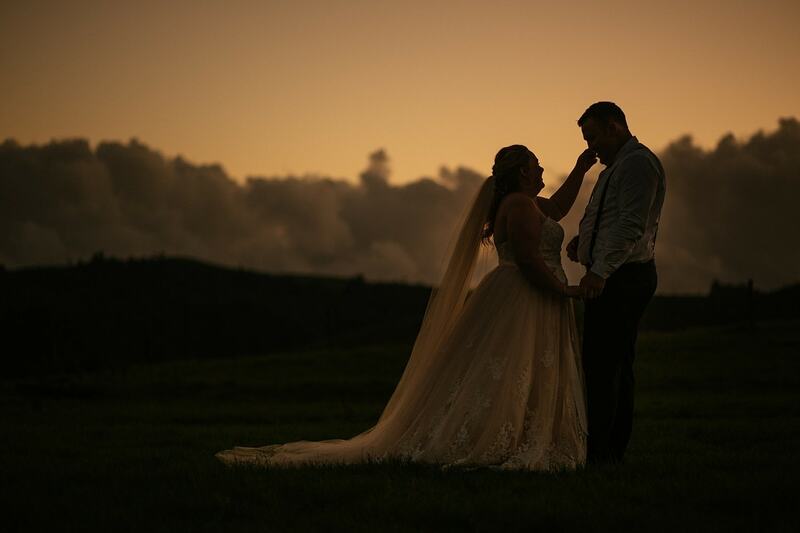 After the ceremony we took some time to get family photos and as the light was fading we raced off to their a place near their original ceremony spot to get some romantic creative shots in the evening light. 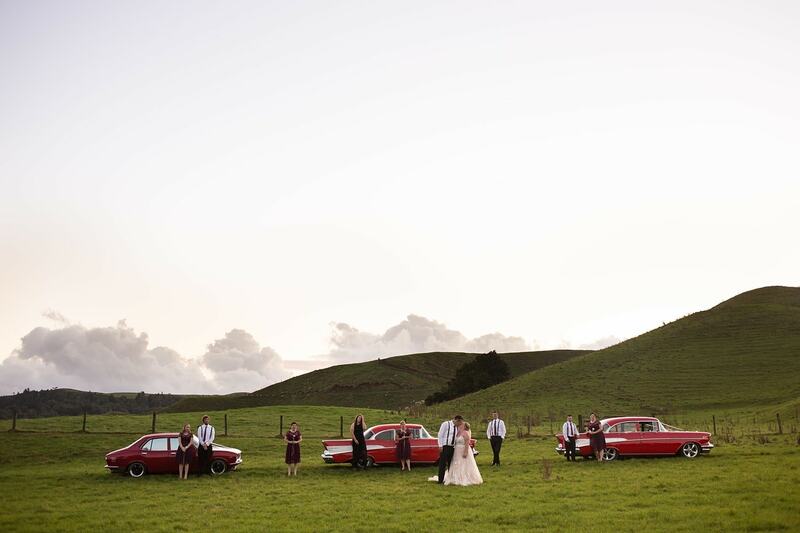 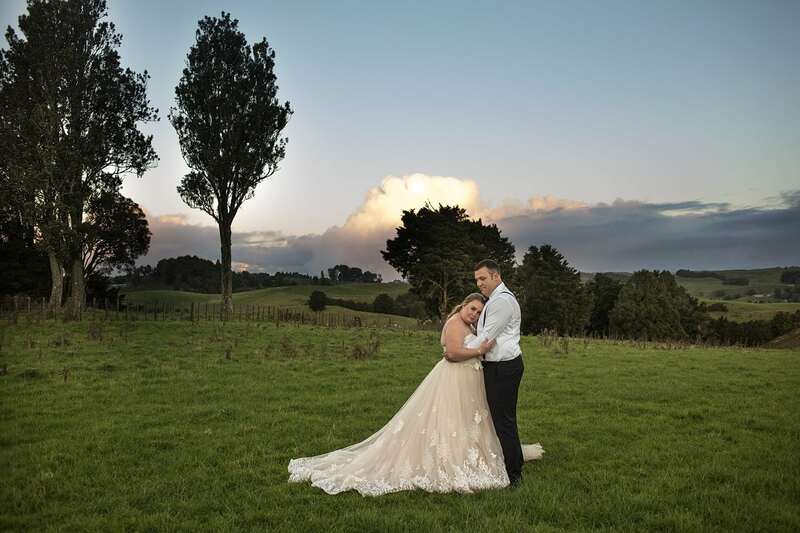 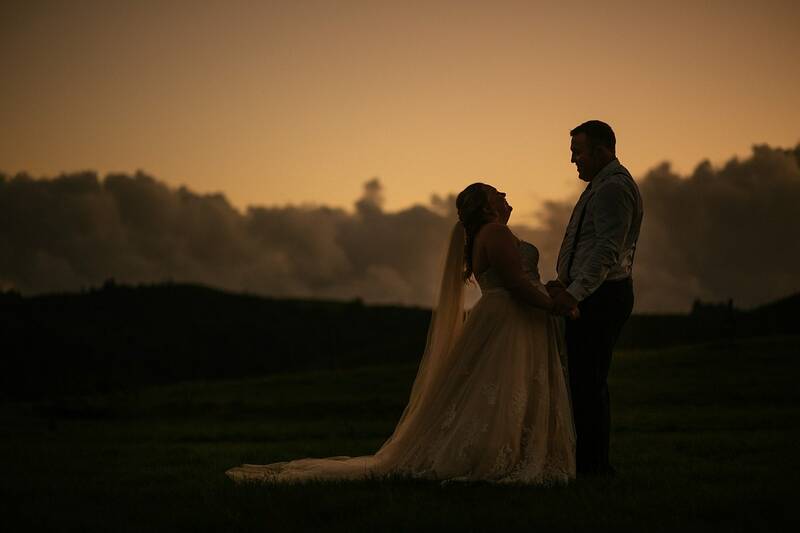 It was boggy and slippery driving up to the landing strip on top of the Piopio hills, but we made it in time and the evening pulled out some gorgeous colours for Ryan and Zoe. 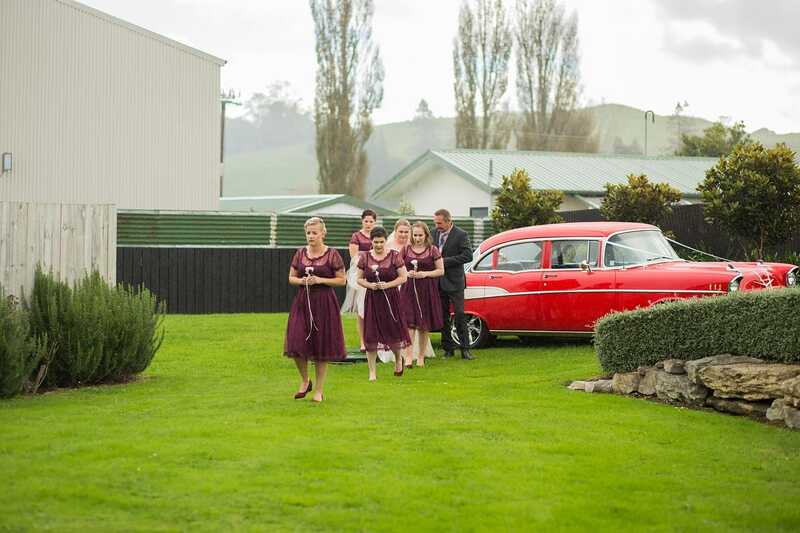 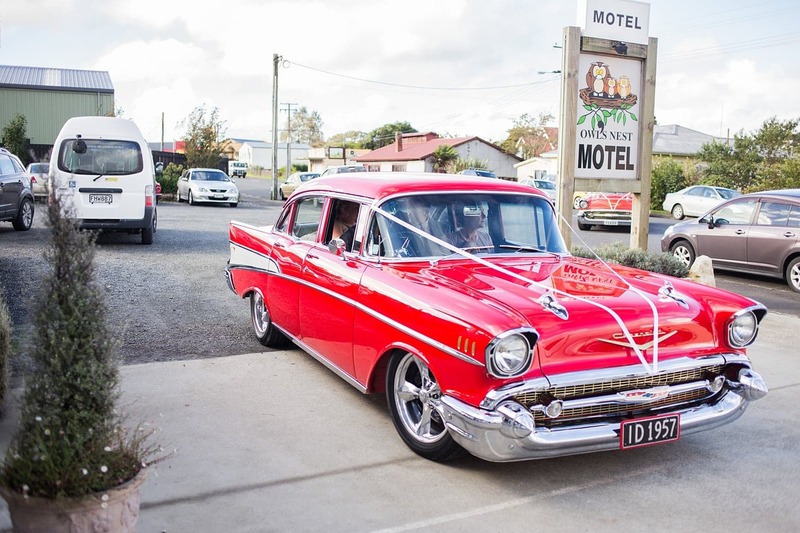 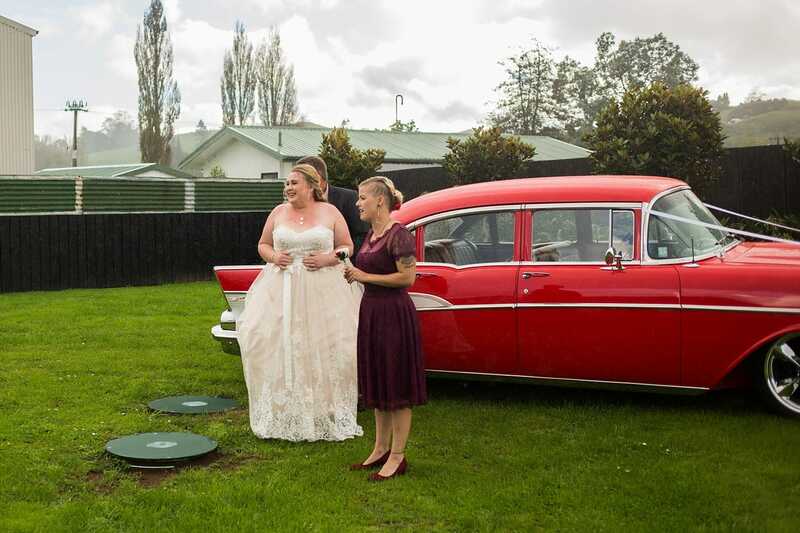 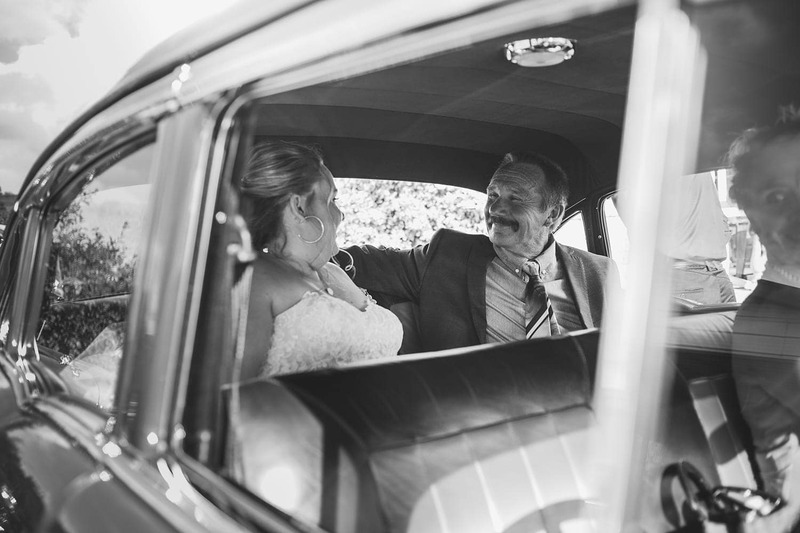 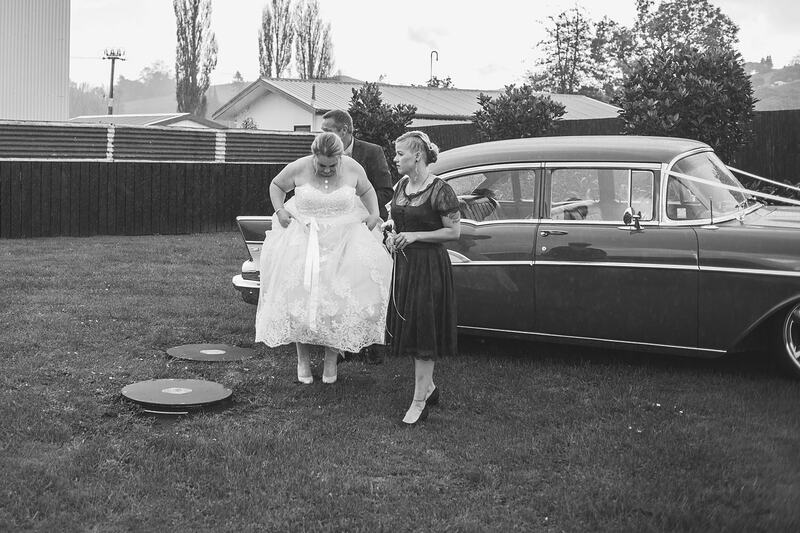 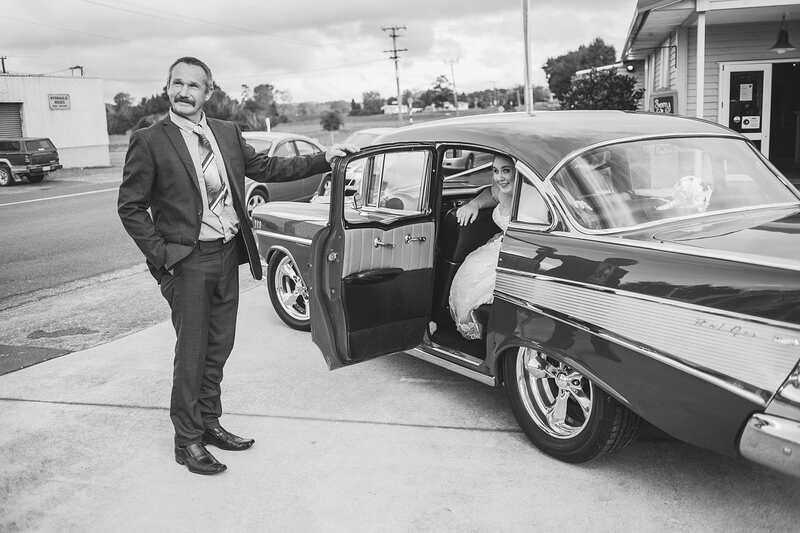 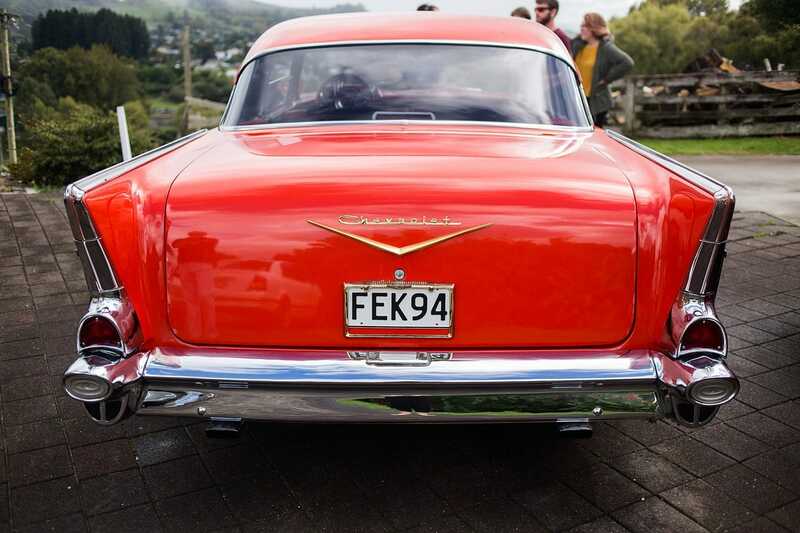 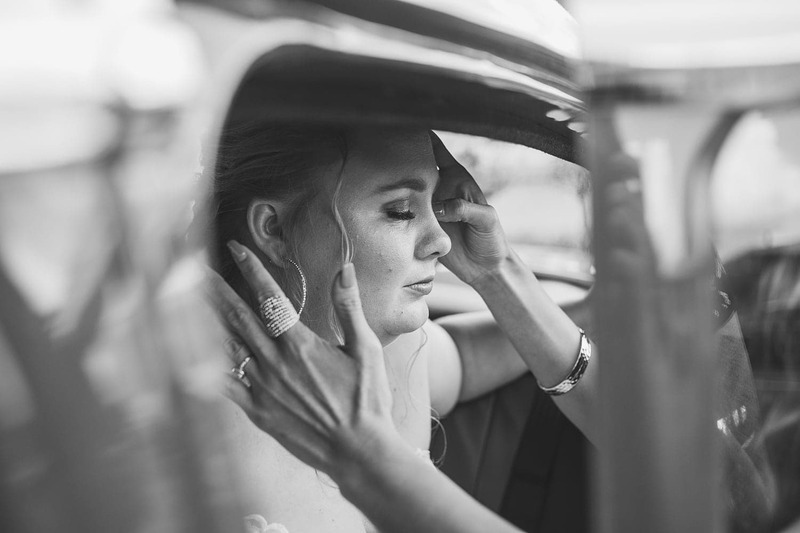 It was time to head back to their reception when one of the cars wouldn’t start – Bridesmaids to the rescue again with their auto electirican skills we were able to get a rolling start and back in plenty of time to start the celebrations. 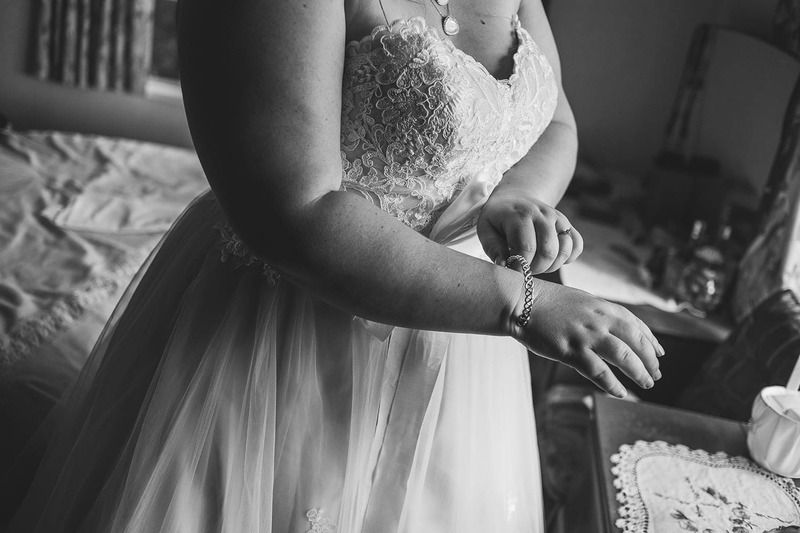 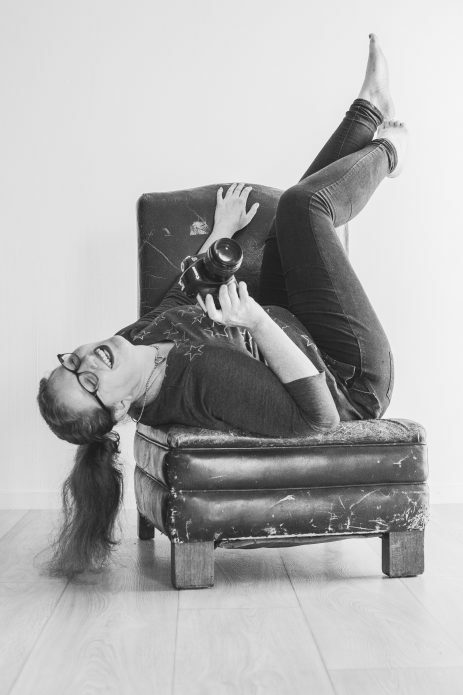 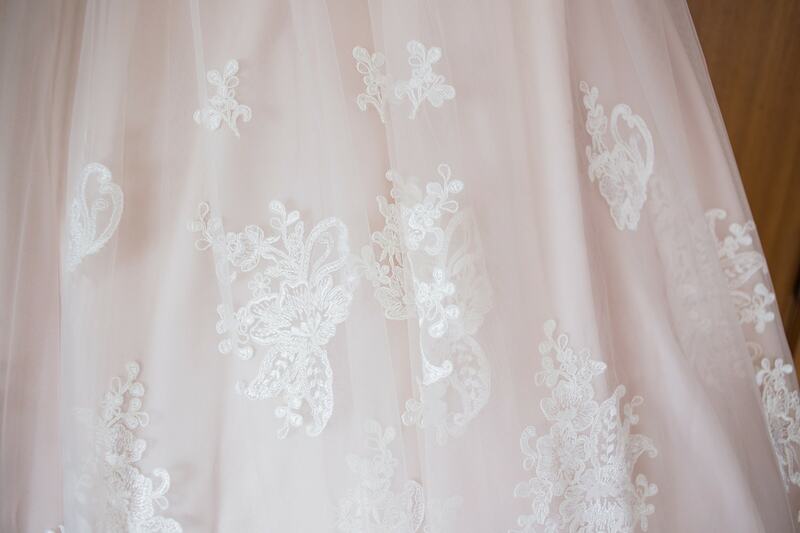 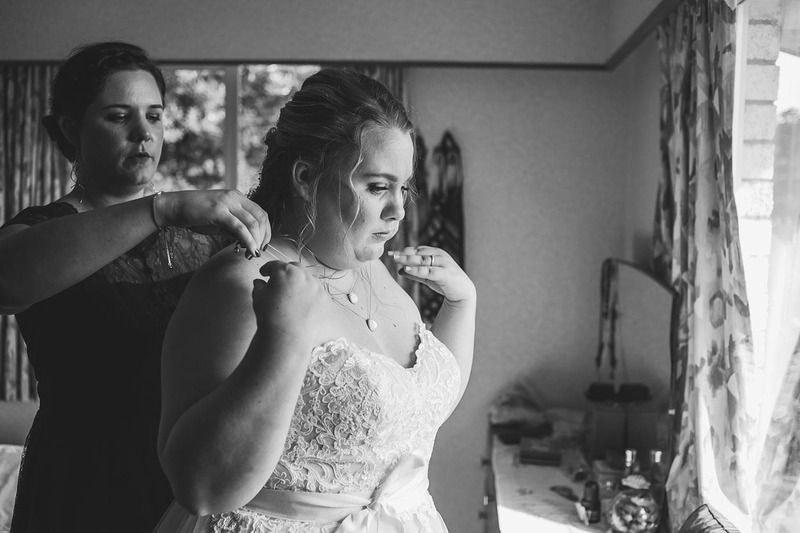 Zoe and Ryan, thank you so much for inviting me along to document your wedding, it was so much fun and such an honor to create these amazing photos of the start of your marriage!